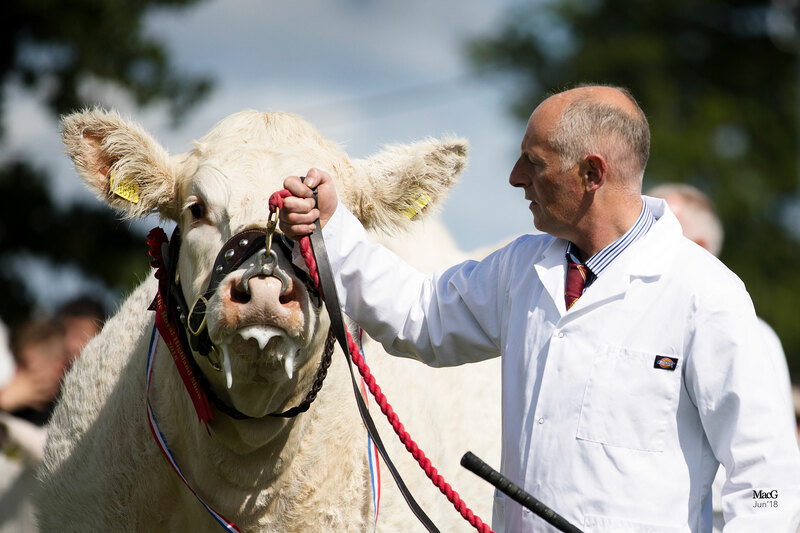 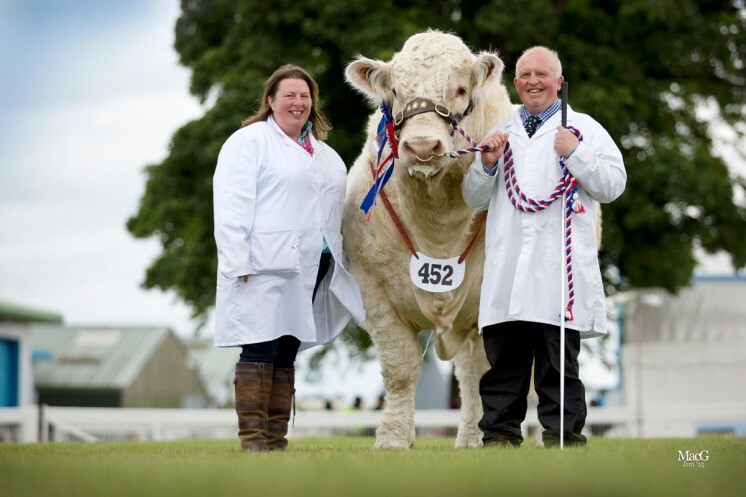 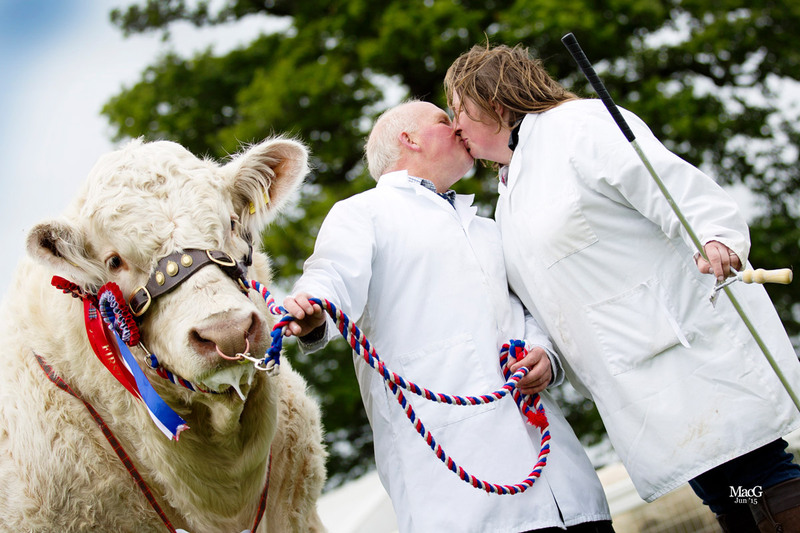 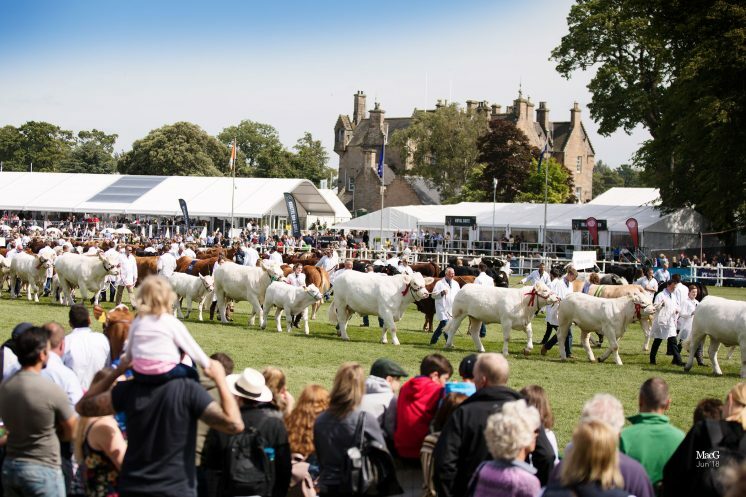 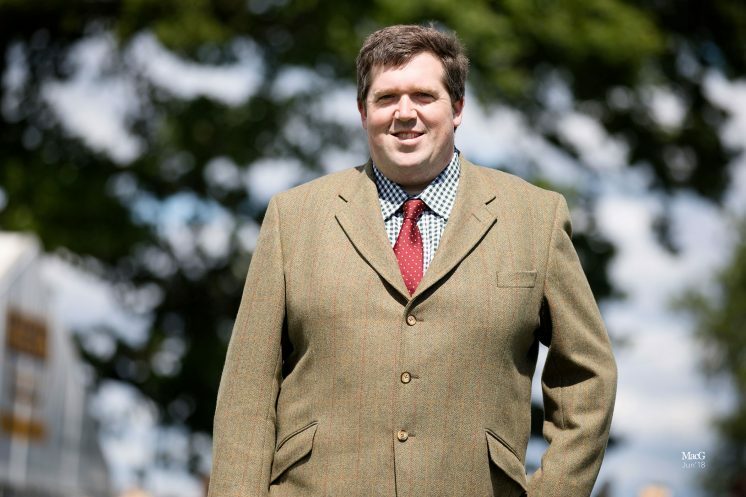 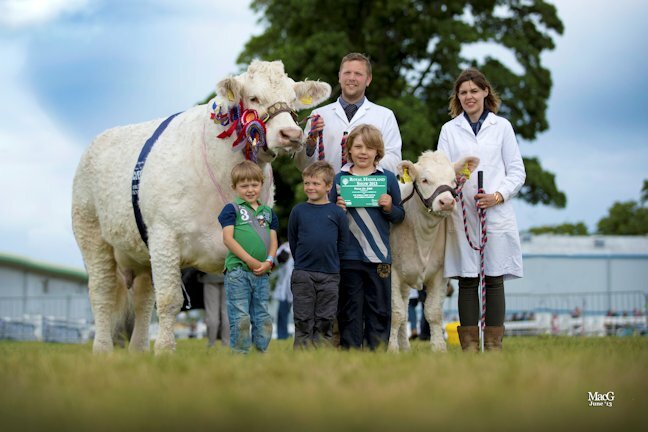 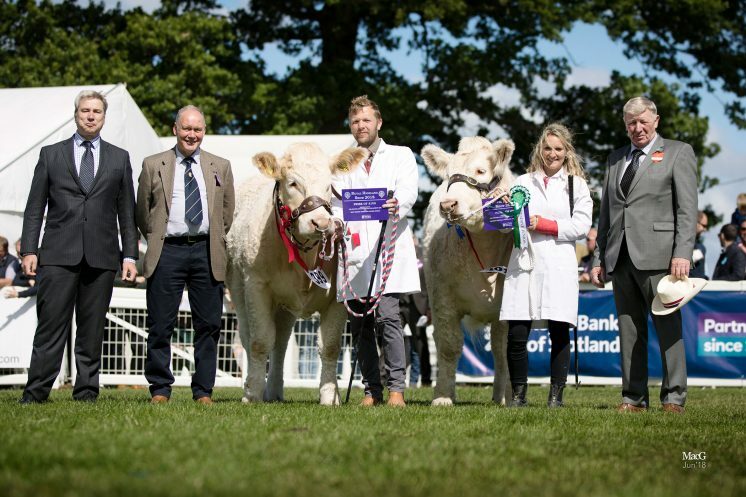 On Saturday, the supreme beef interbreed championship judge James Gammie, Laurencekirk, Kincardineshire, tapped out the six year old Elgin Catherine, a homebred cow by Gower Versace, with her four month old heifer calf by Goldies Banker at foot as champion. 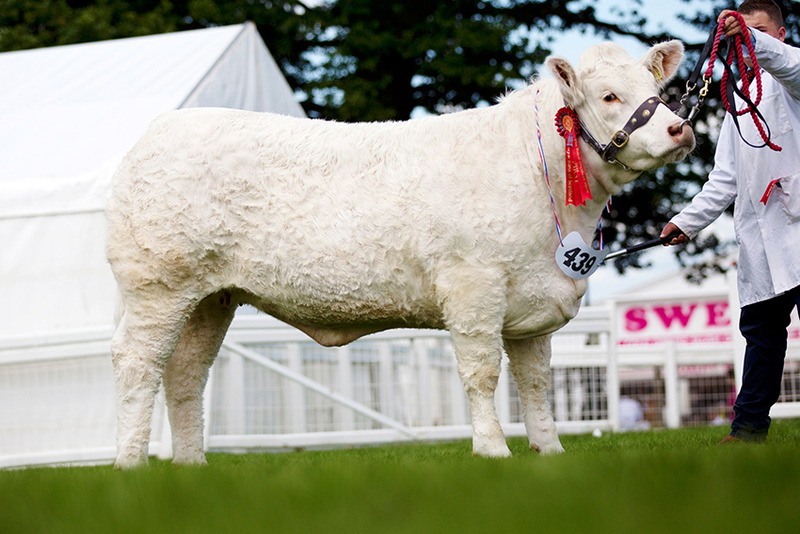 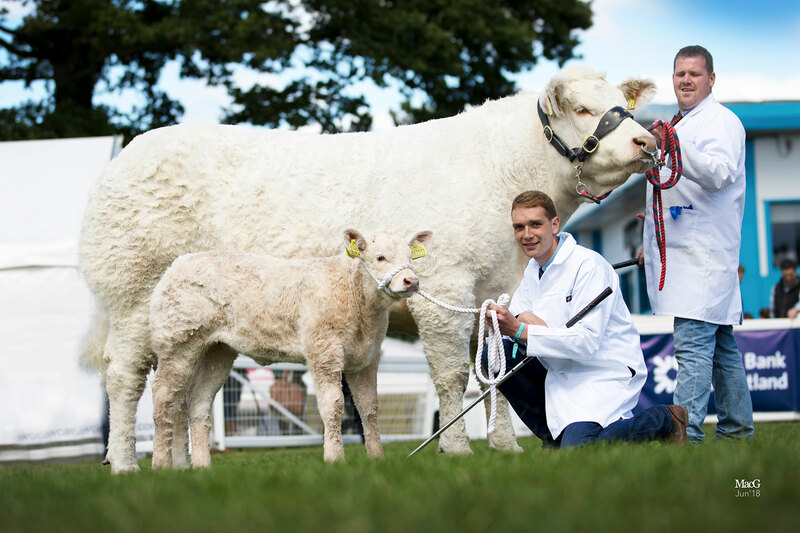 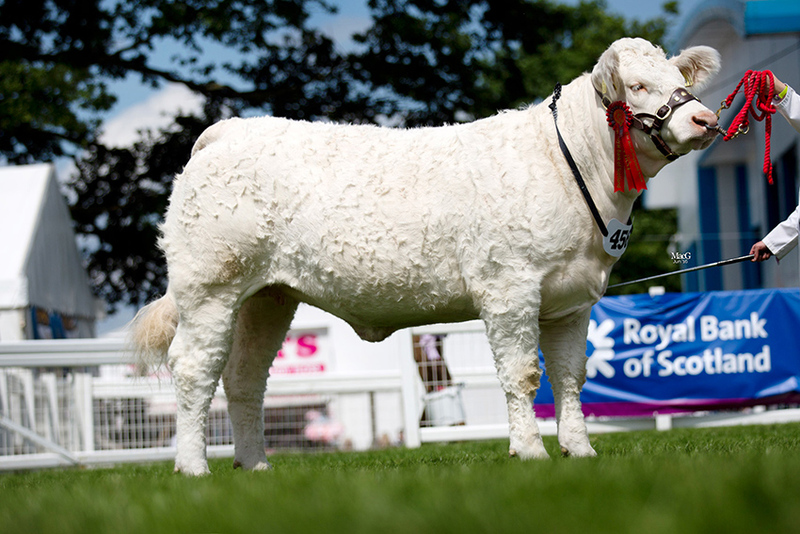 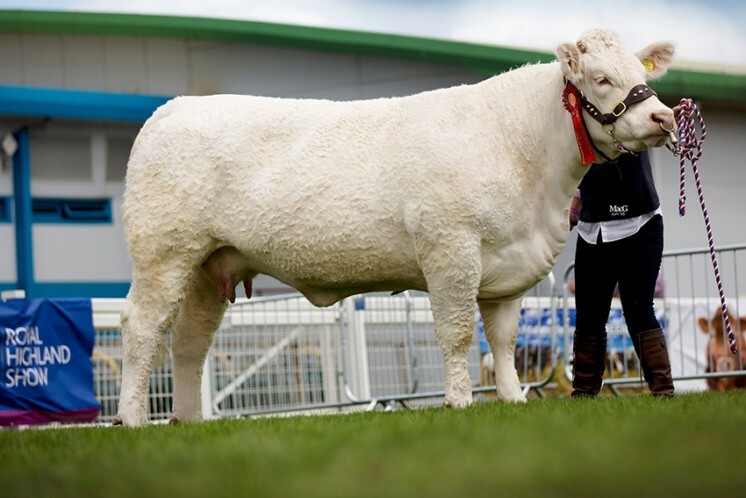 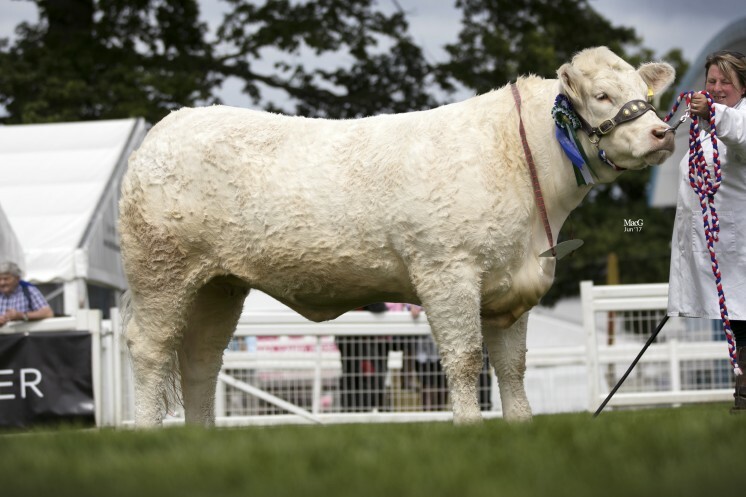 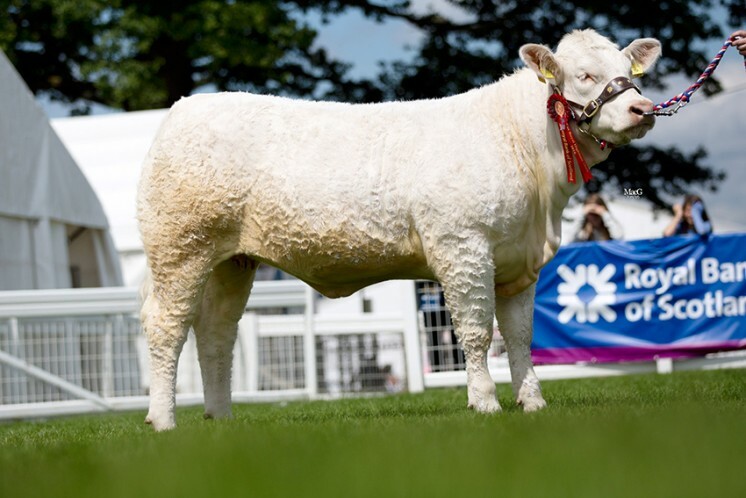 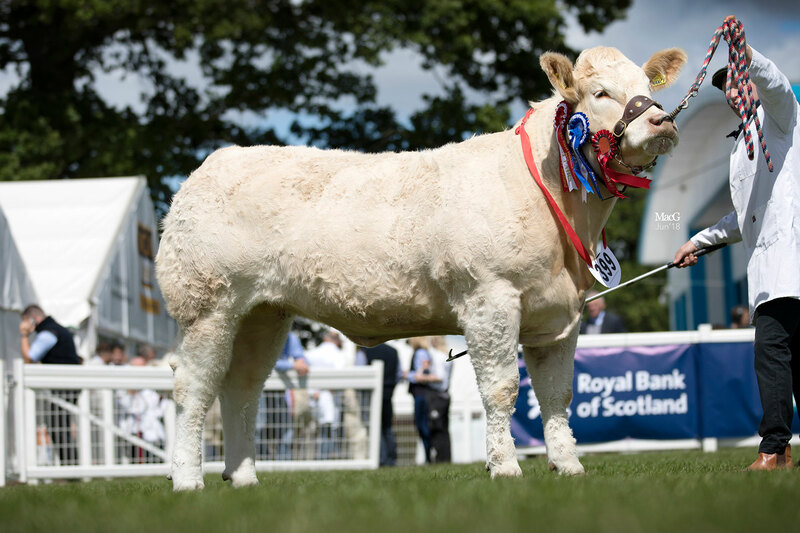 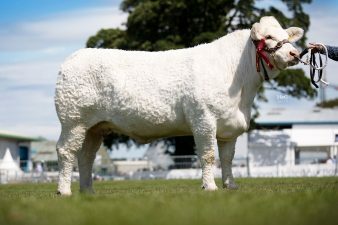 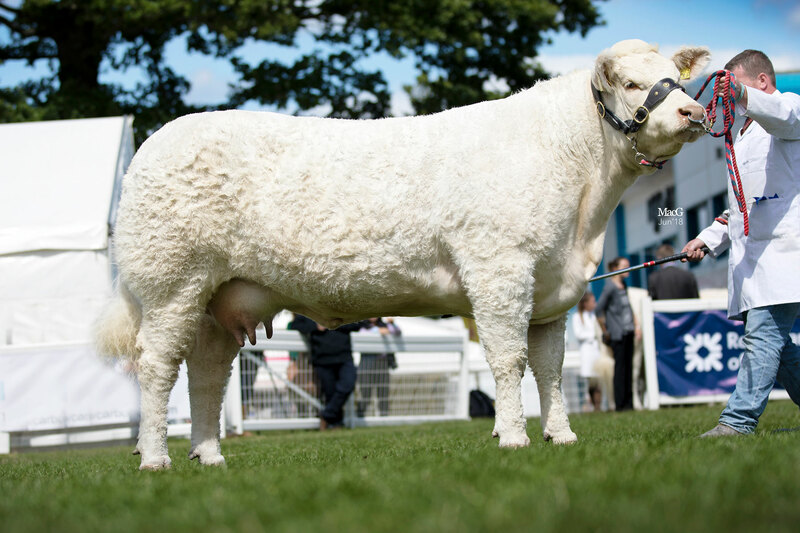 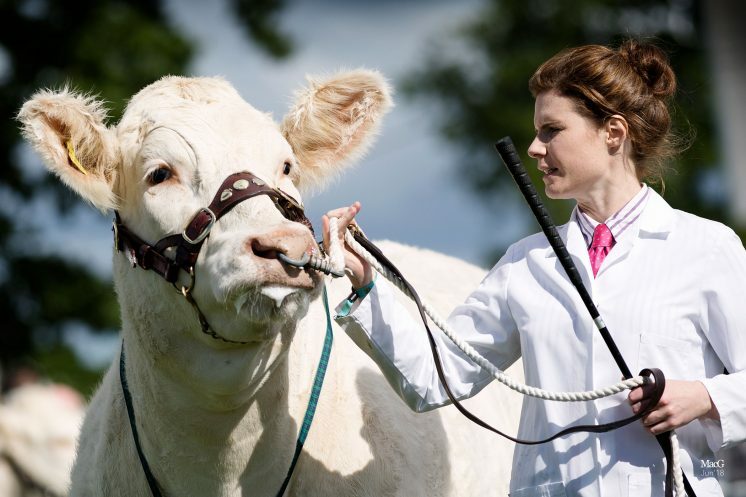 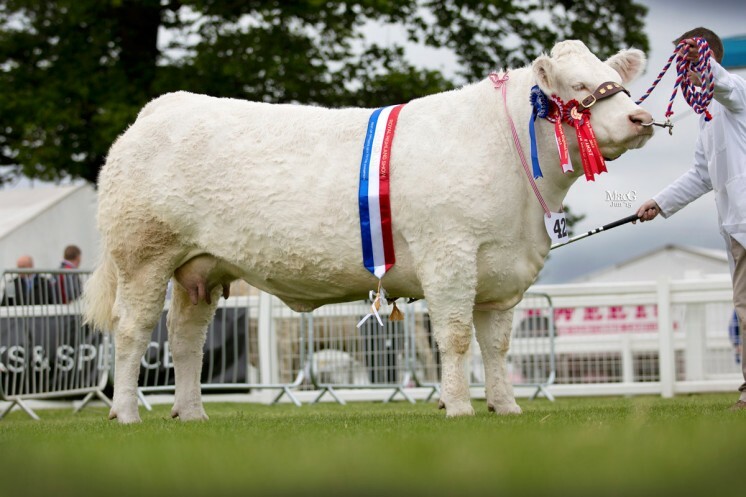 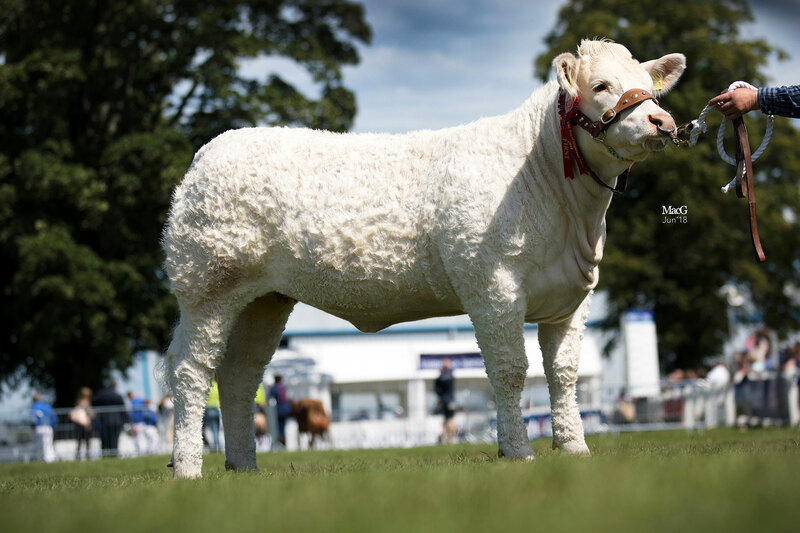 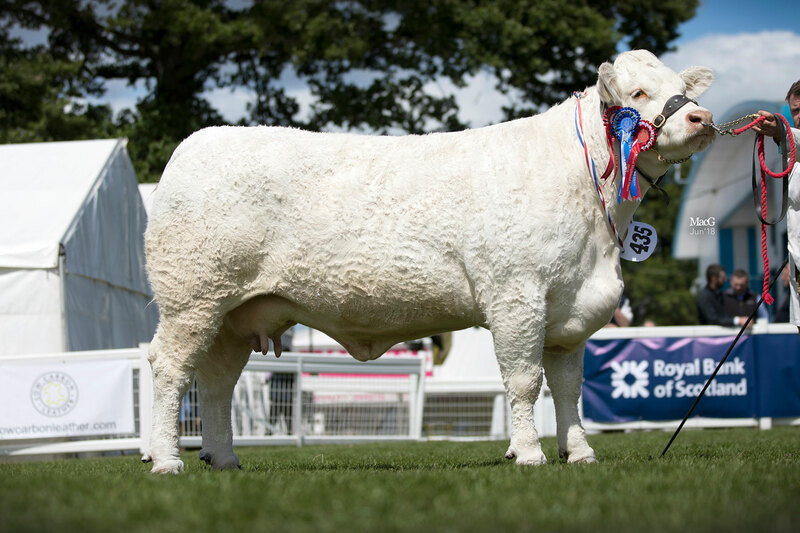 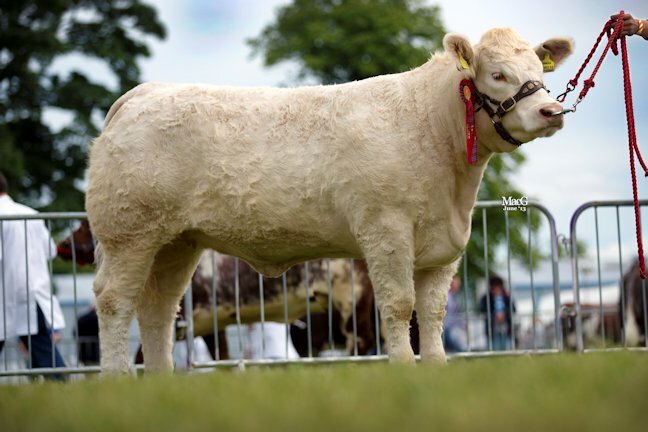 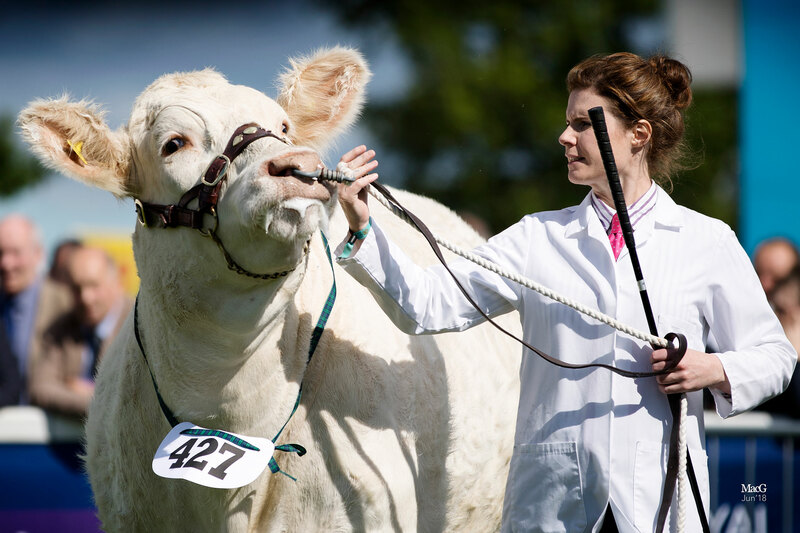 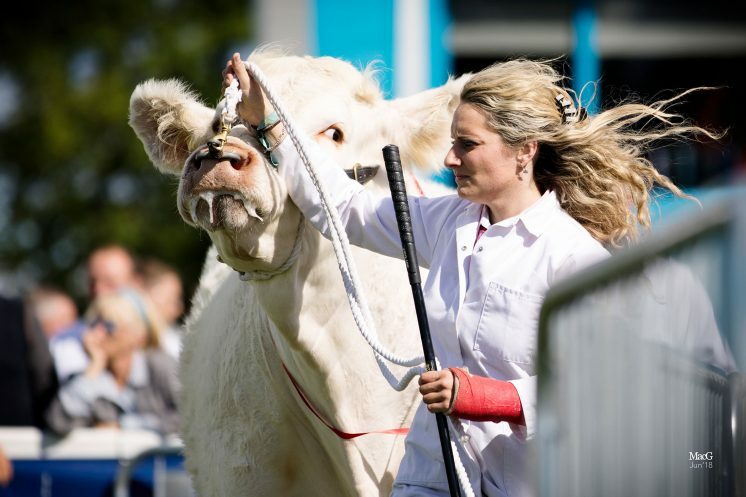 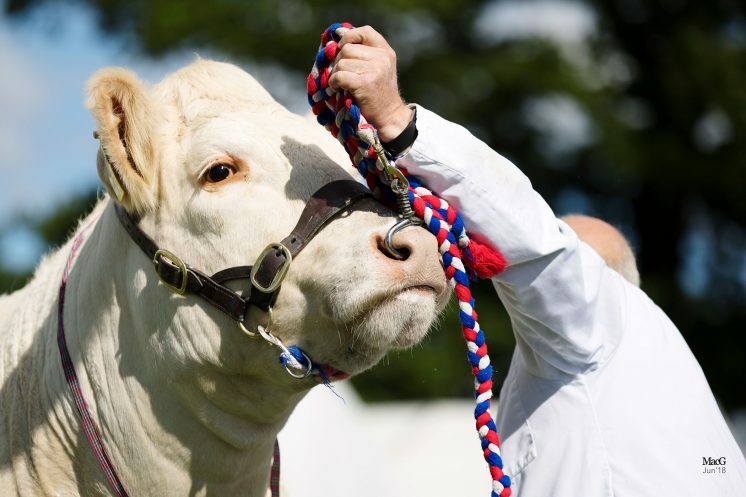 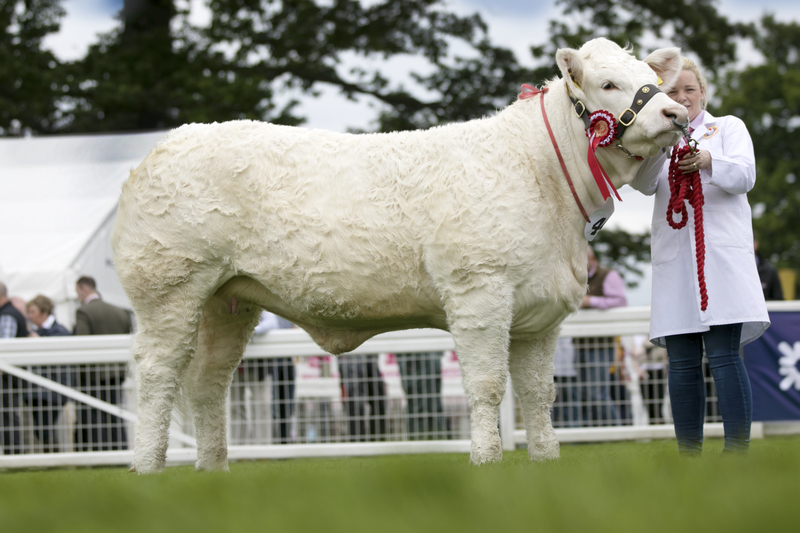 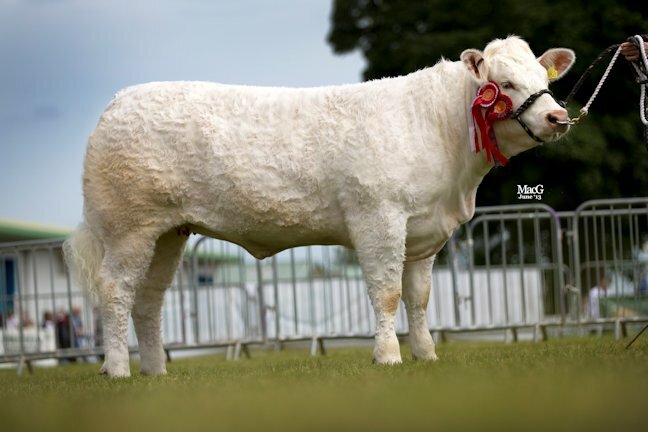 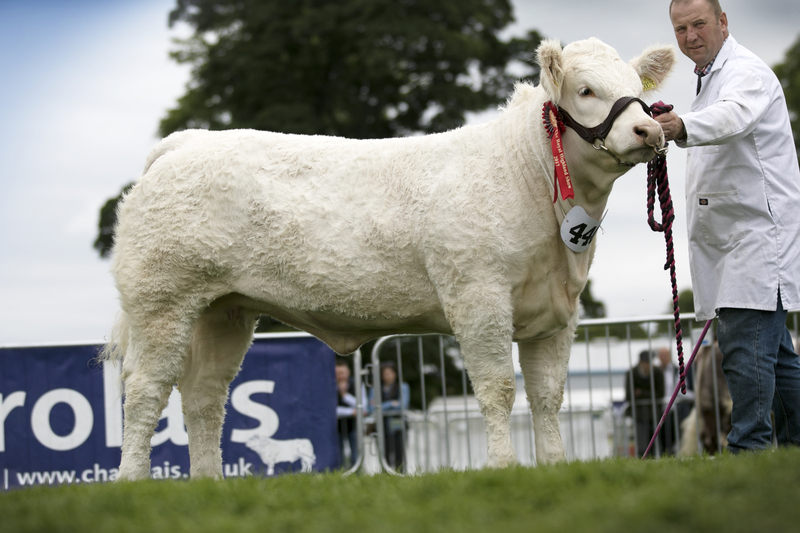 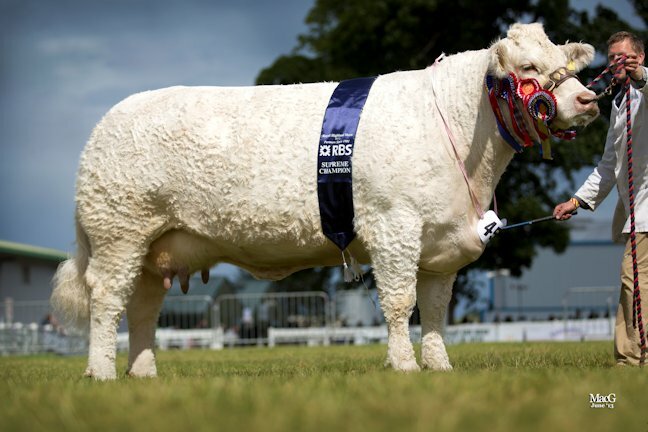 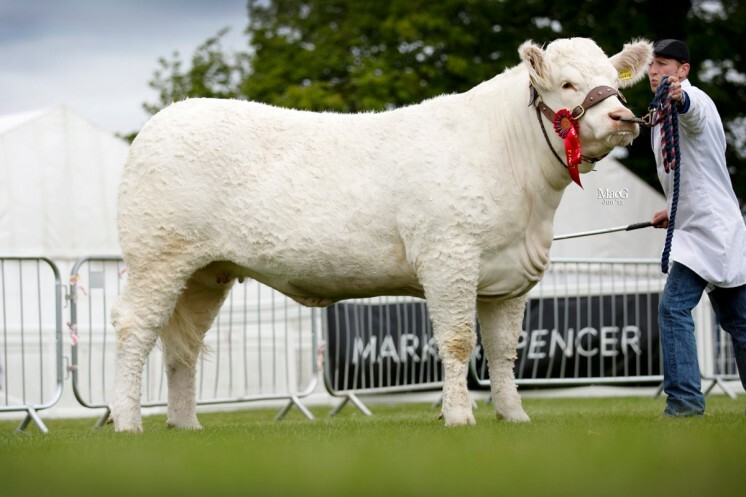 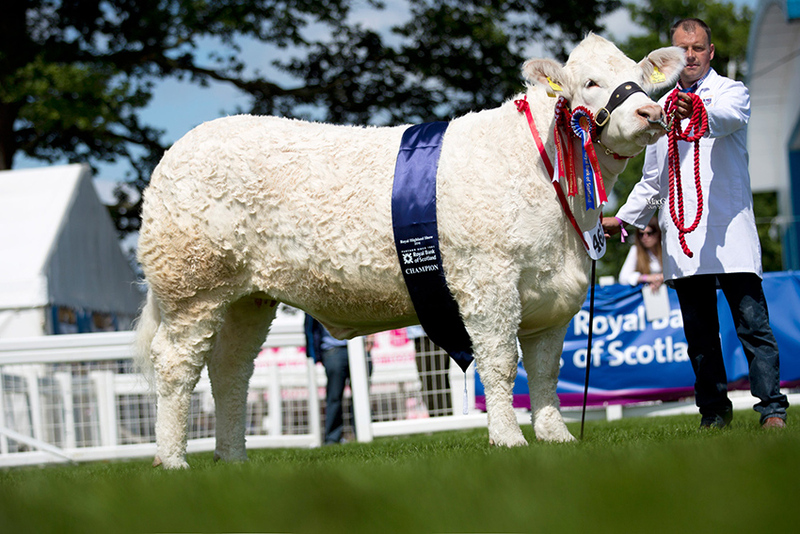 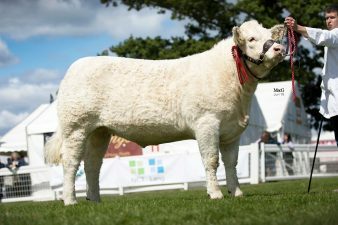 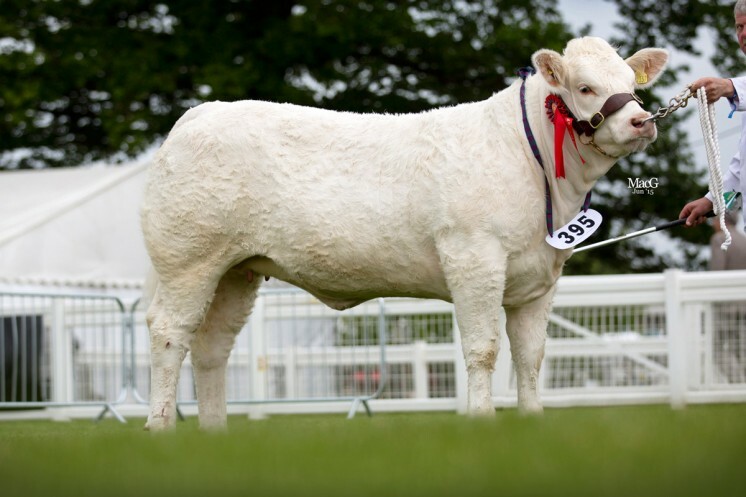 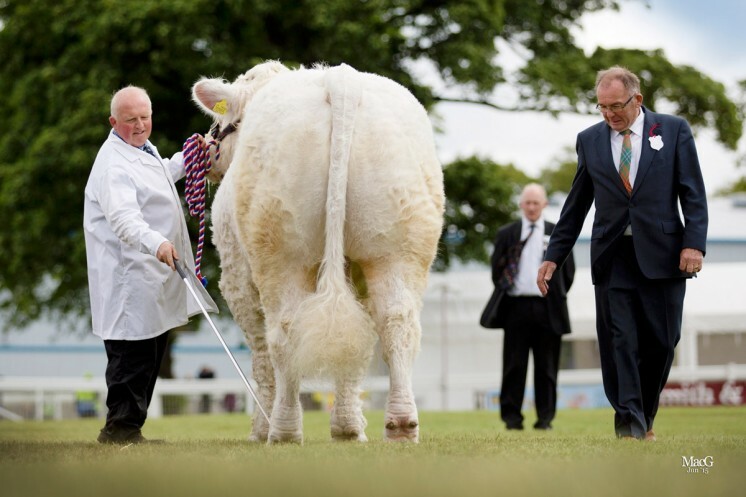 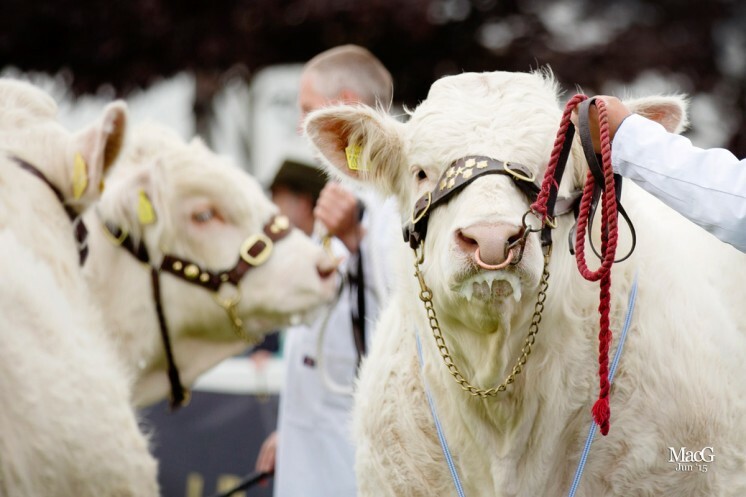 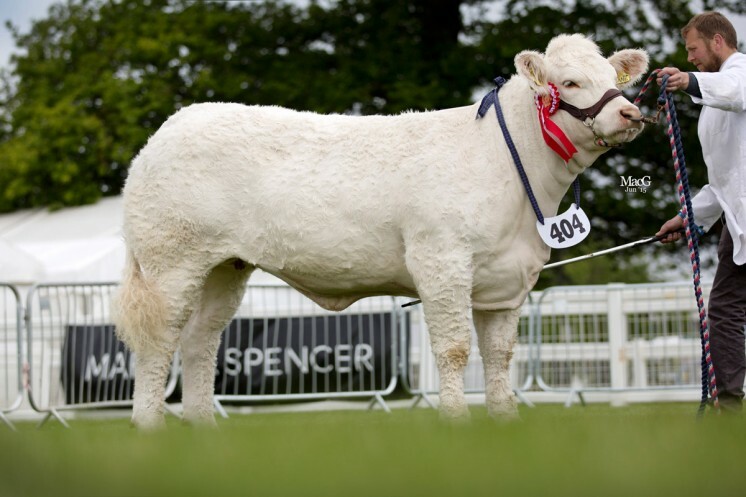 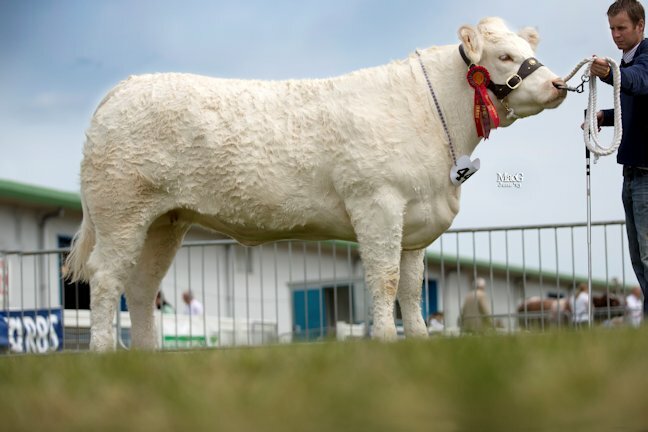 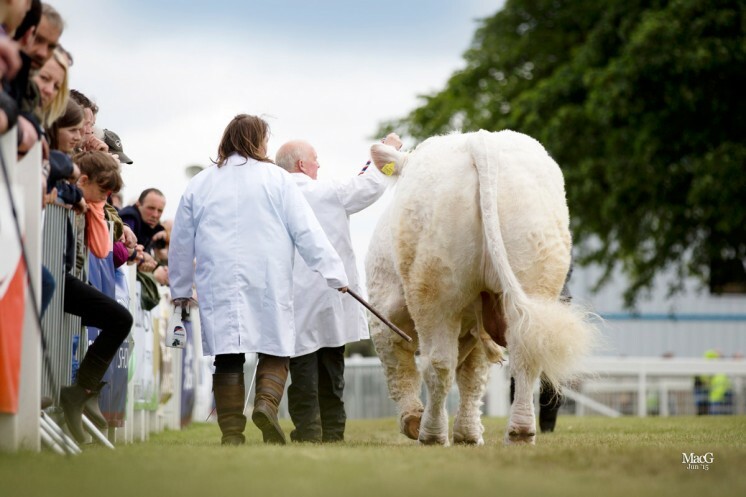 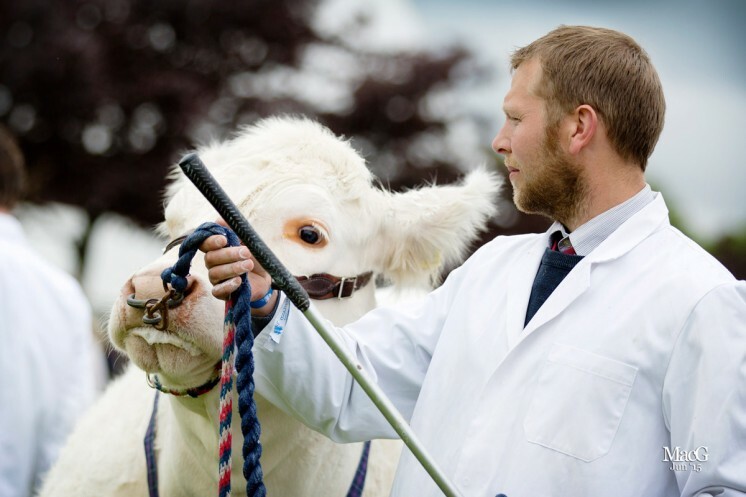 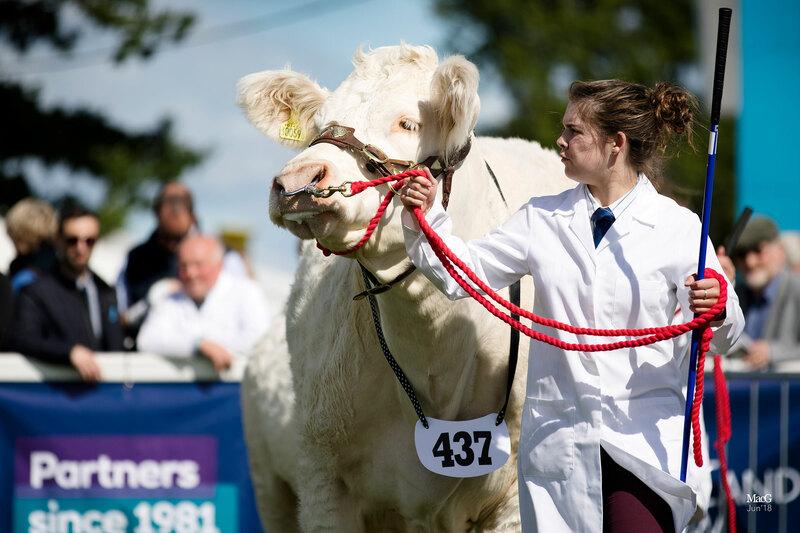 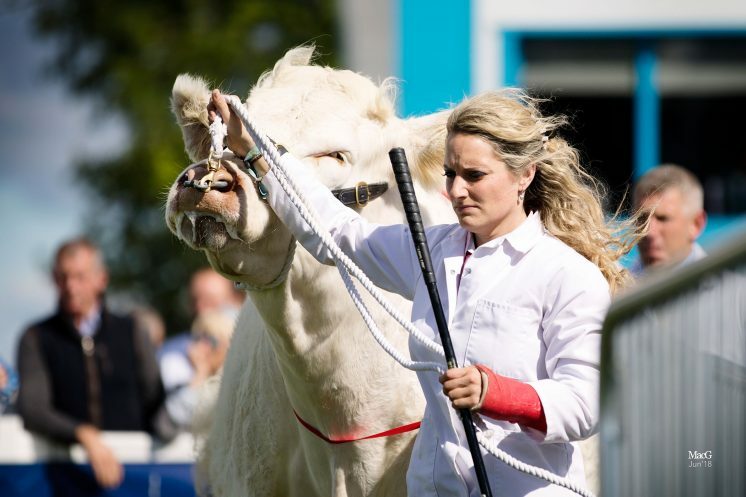 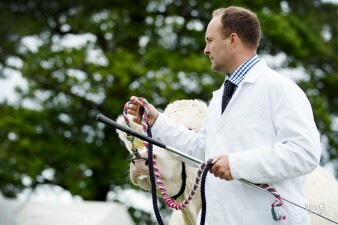 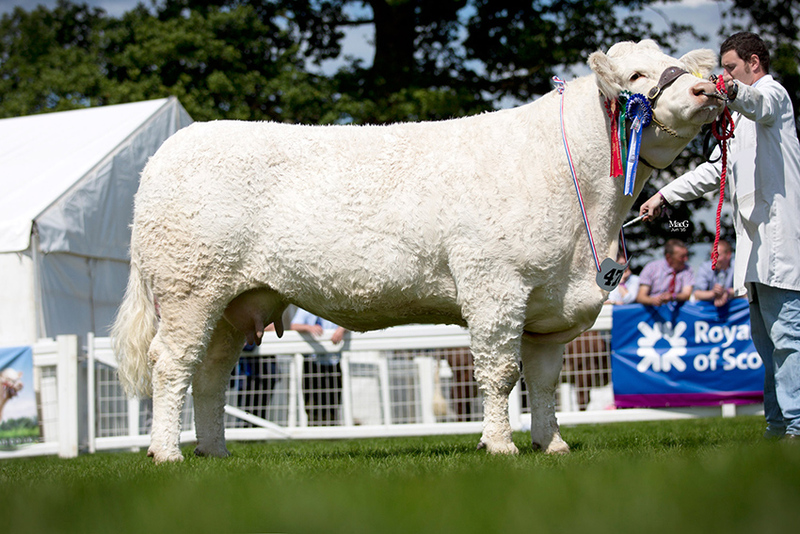 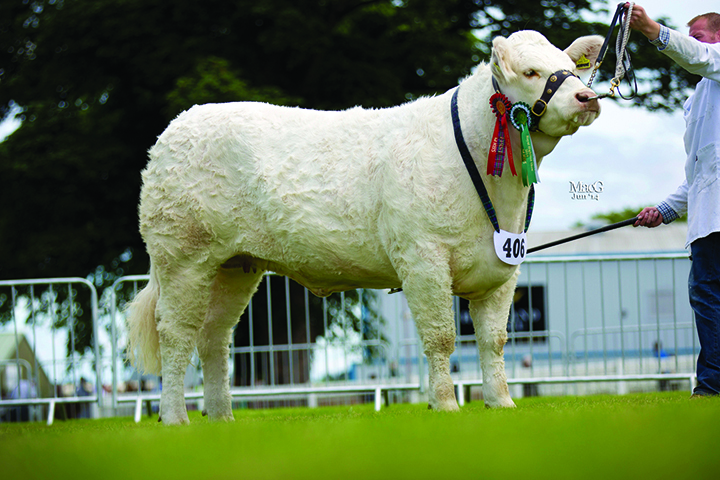 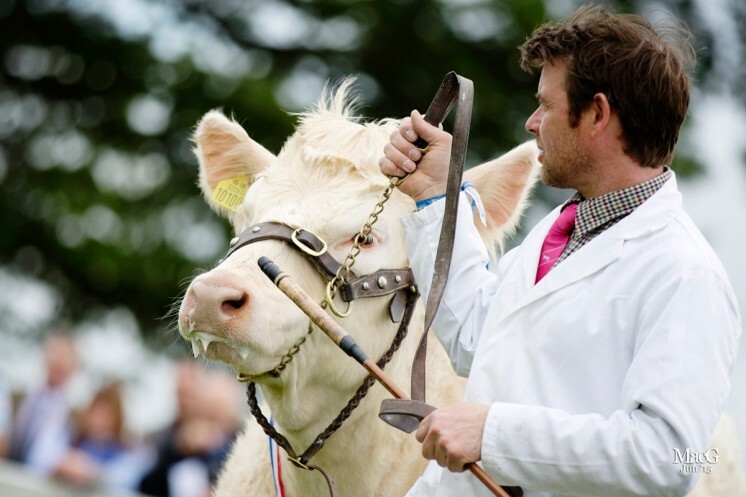 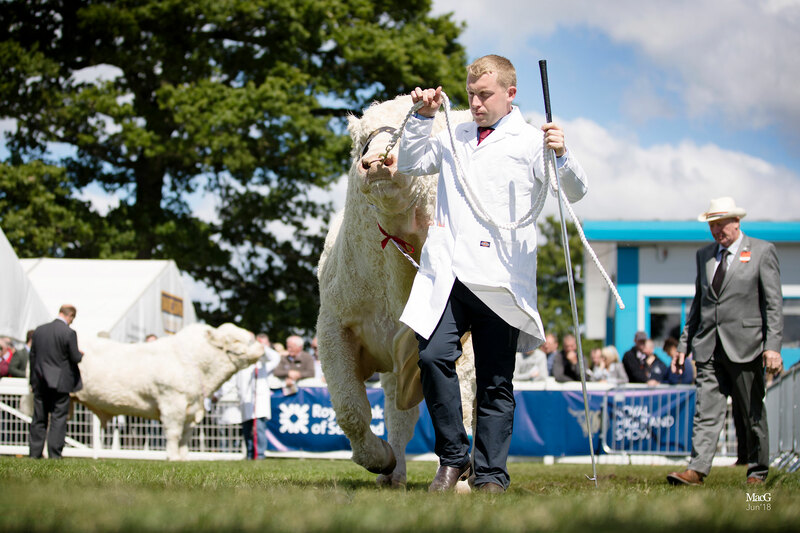 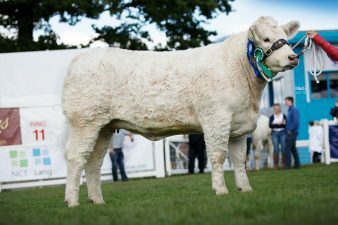 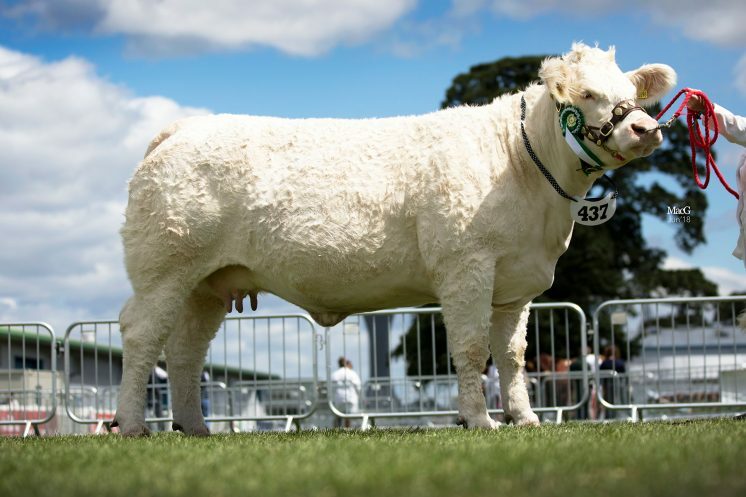 Exhibited by breeders R A Milne, Elgin, Morayshire, this was Catherine’s first appearance on the show circuit after claiming the junior heifer championship at the same event in 2009. 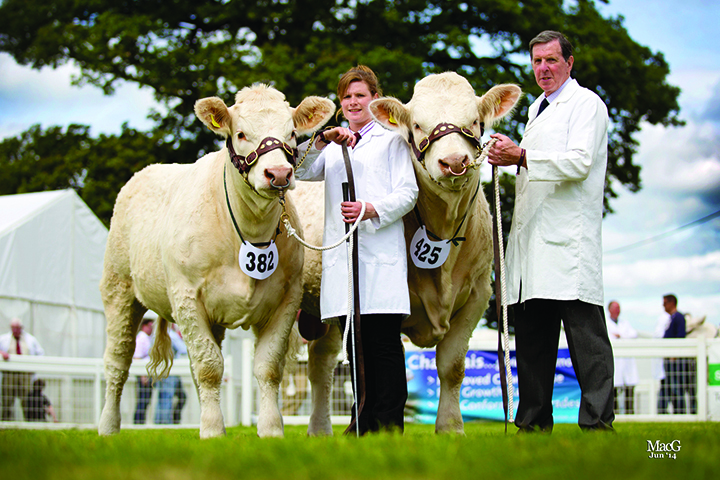 Elgin Catherine also represented the breed in the Asda Beef Cattle Pairs competition alongside the reserve breed champion Maerdy Grenadier, a two year old Maerdy Dynamite son exhibited by Major Walter, Balthayock, Perthshire, and D Muirhead, Arbroath, Angus, and bred by D E Evans, Mold, Flintshire, where they scooped the top spot under the eye of judge John Elliot, Roxburgh Mains, Kelso. 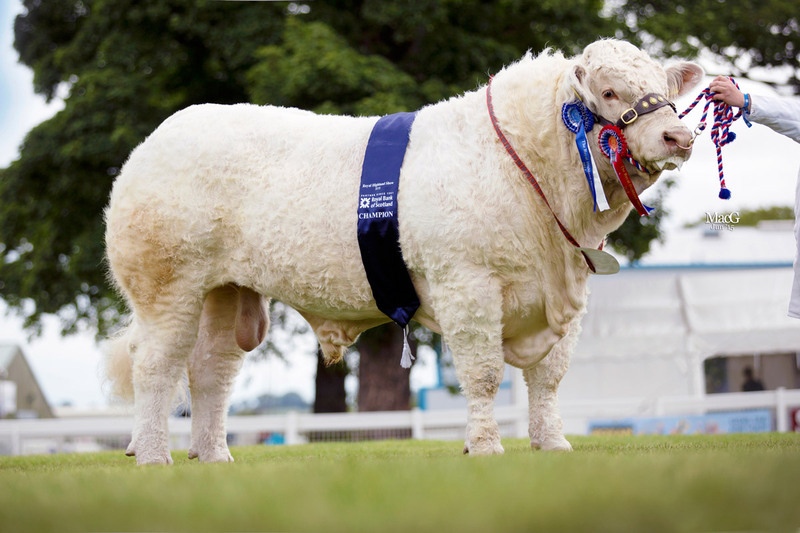 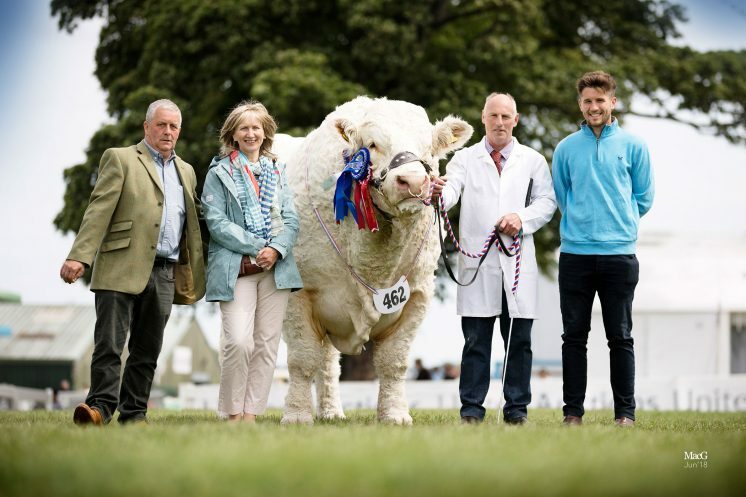 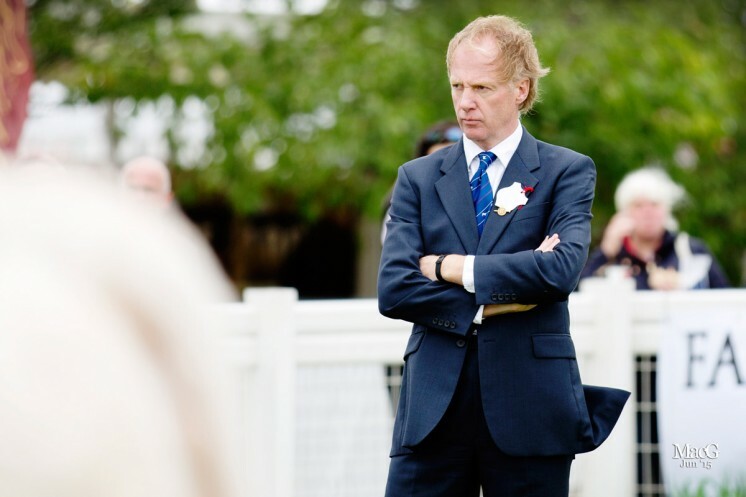 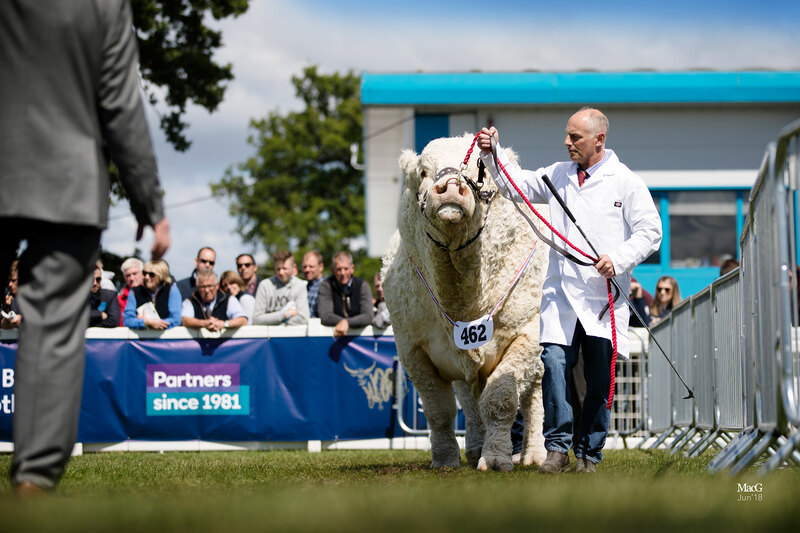 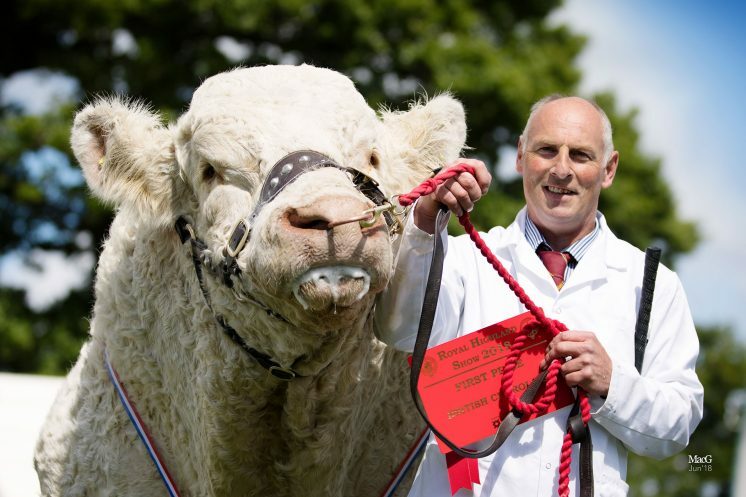 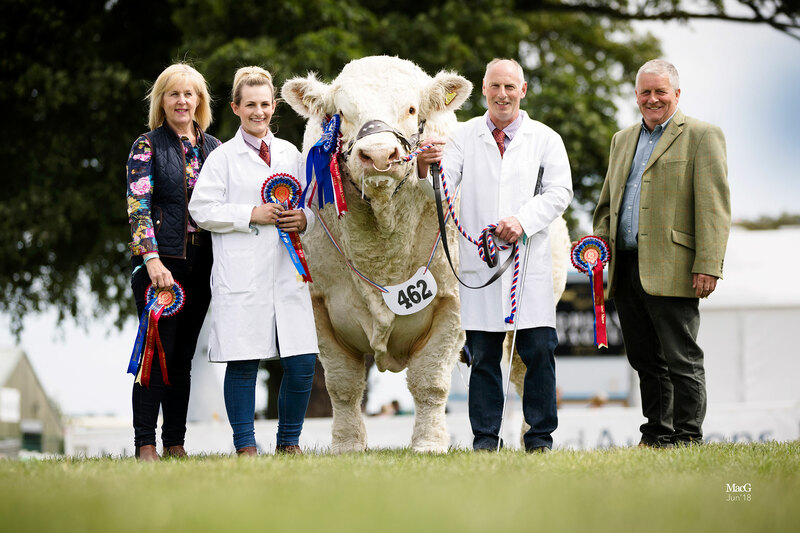 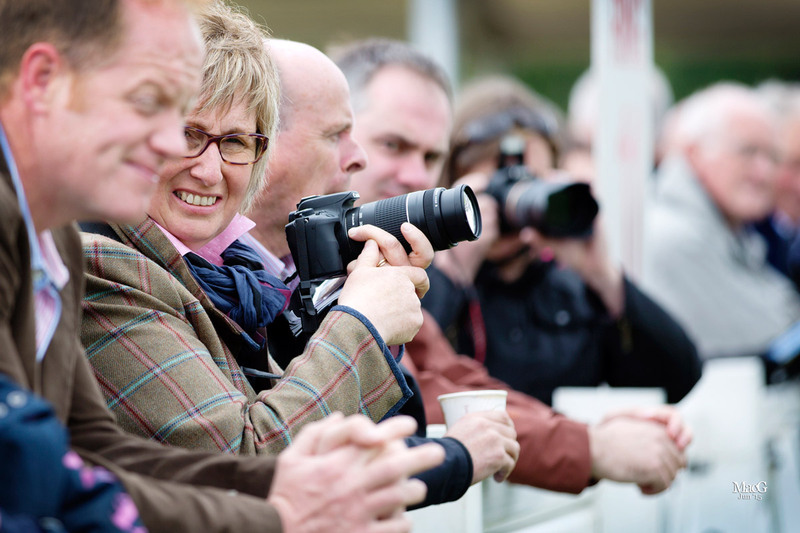 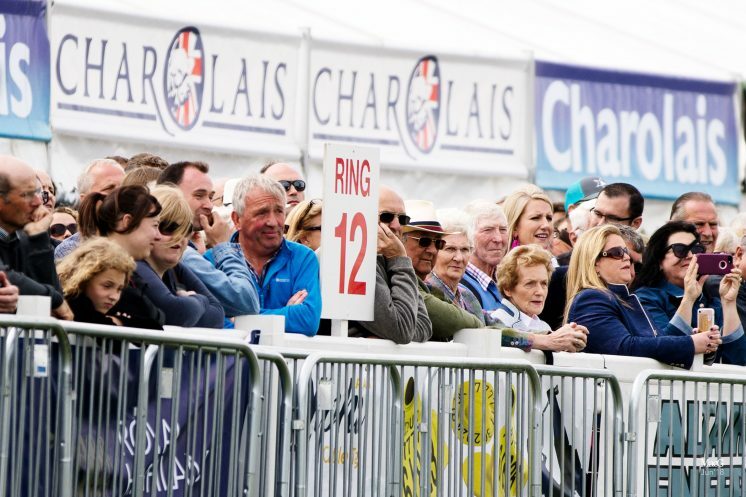 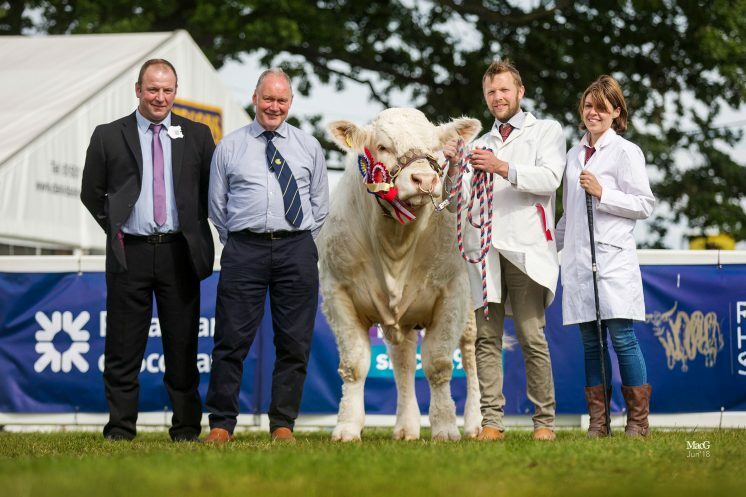 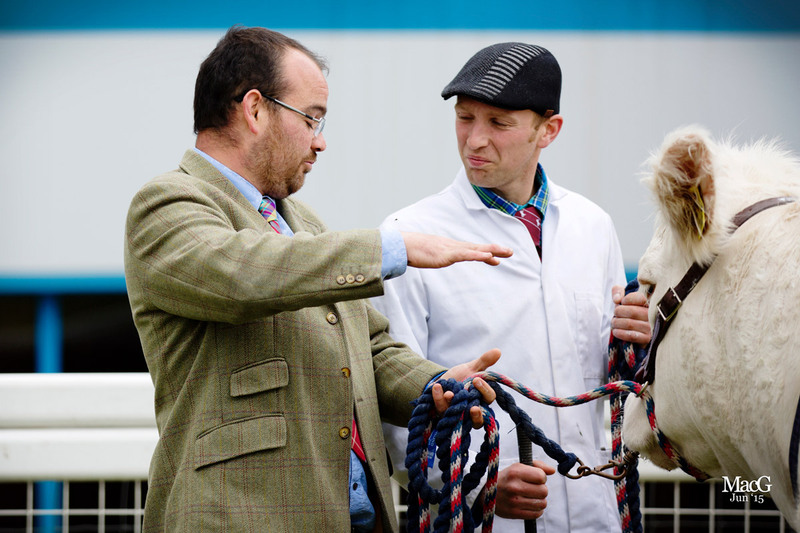 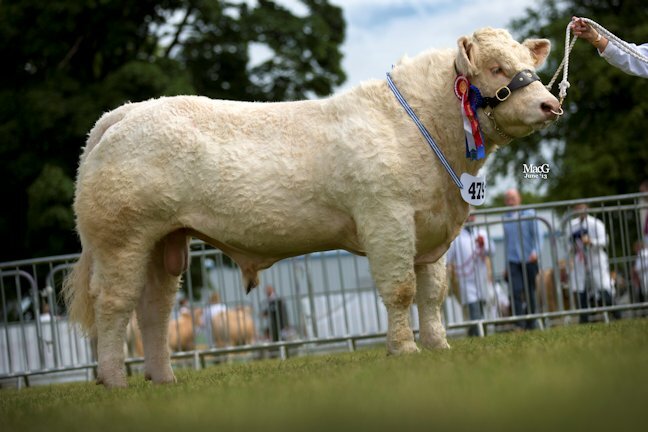 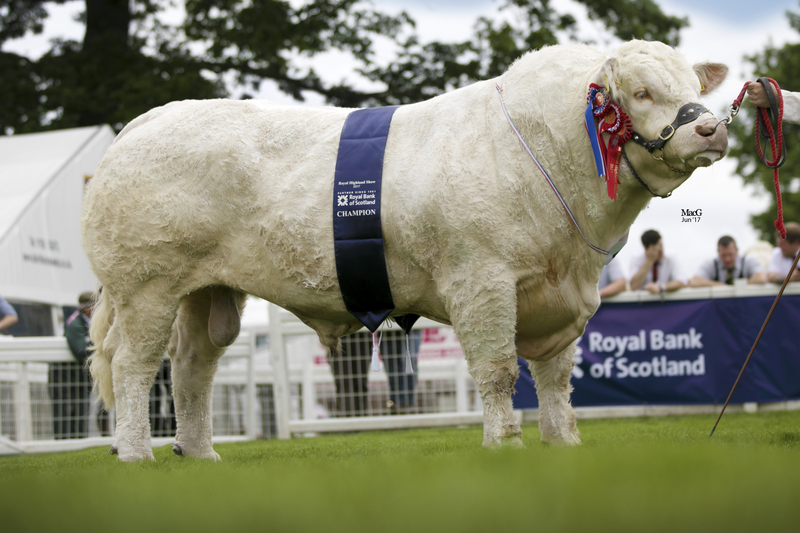 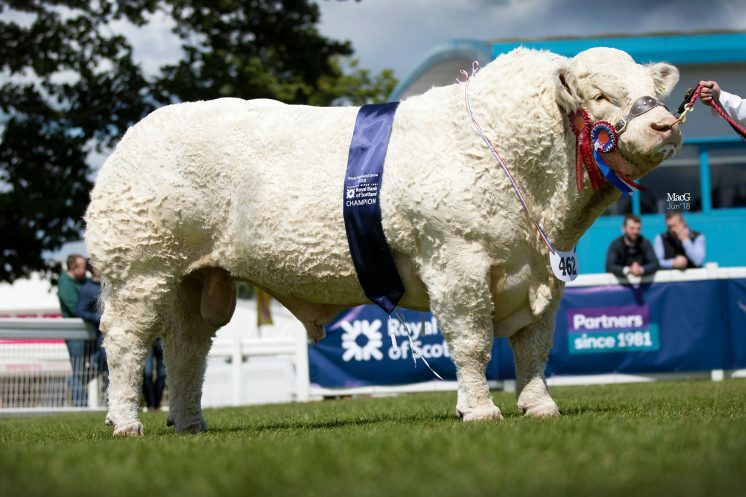 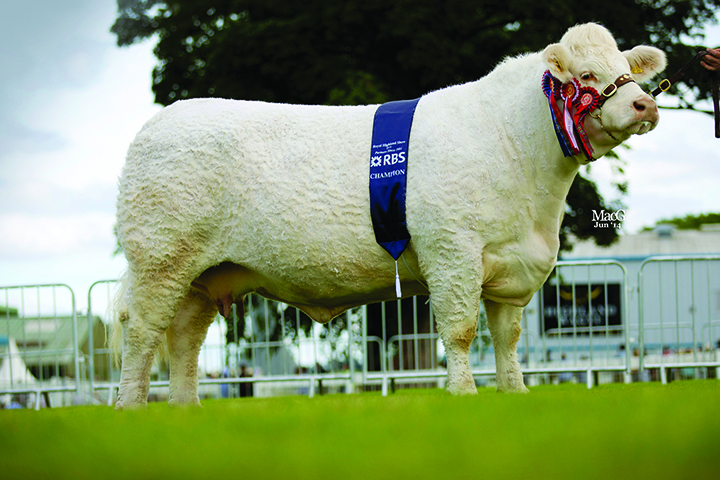 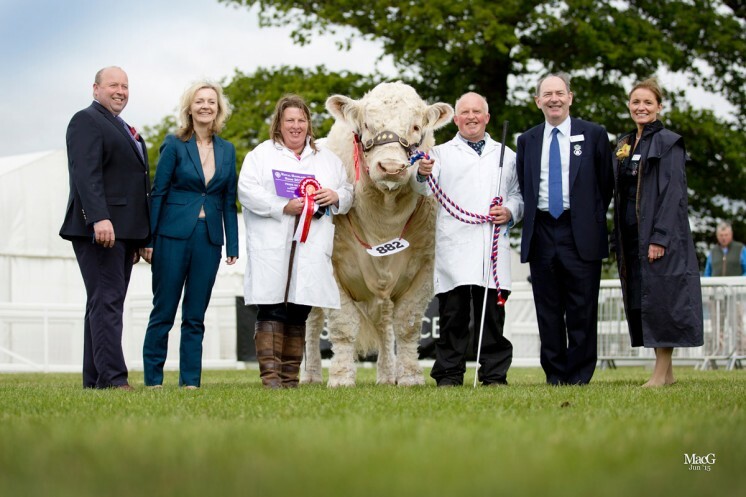 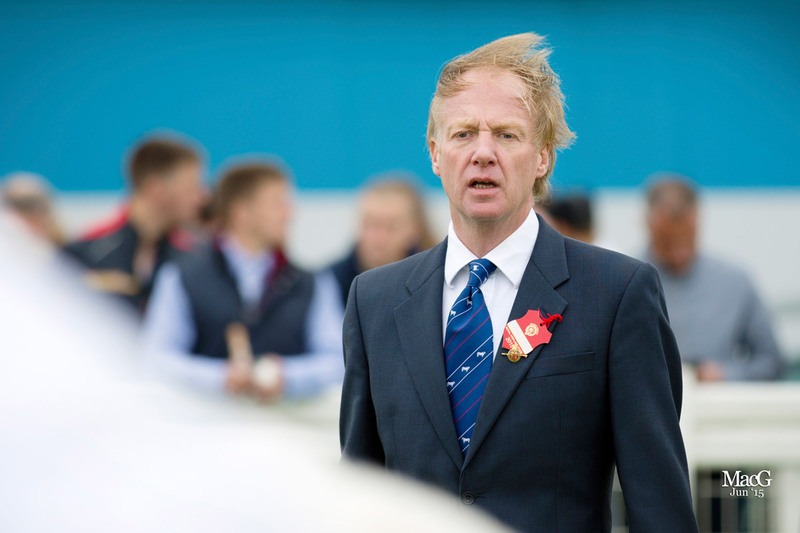 Grenadier sold for a joint bid of 20,000gns at Stirling in February following a successful 2012 show season culminating in the supreme breed and junior interbreed champion titles as well as champion performance recorded bull at the Royal Welsh Show. 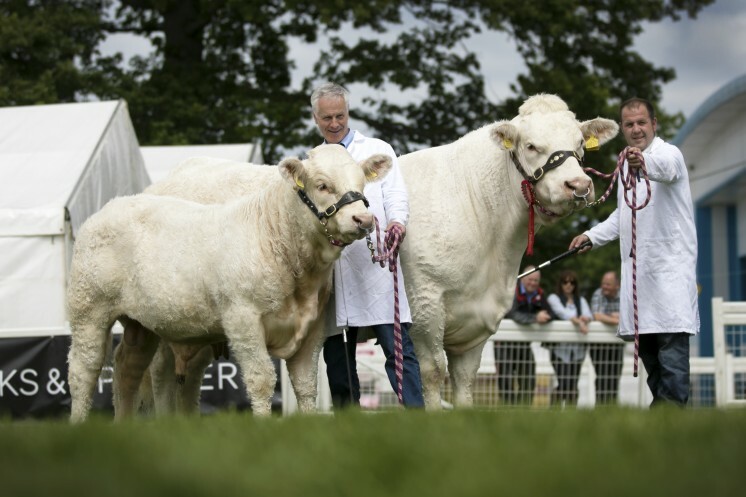 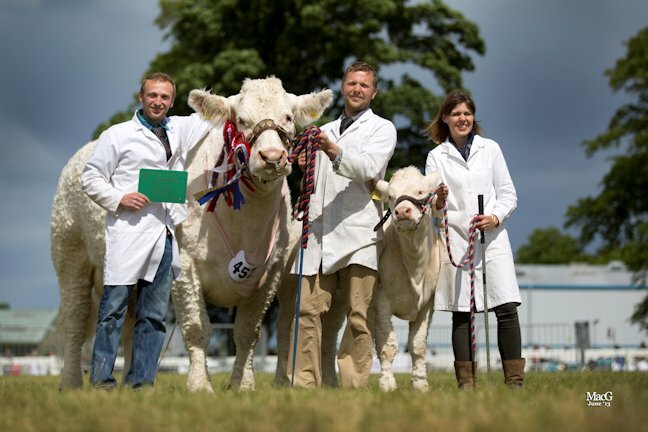 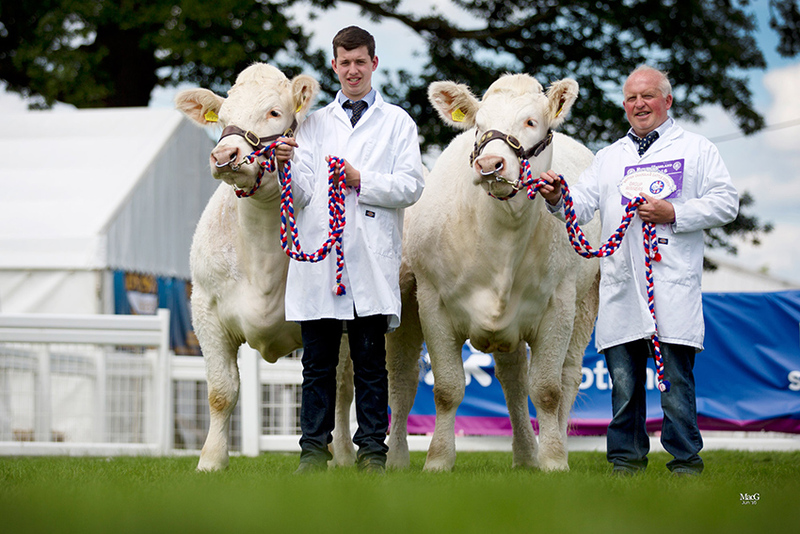 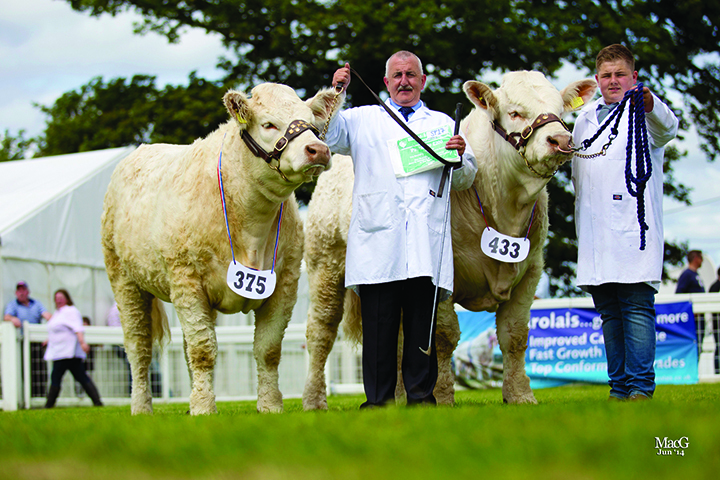 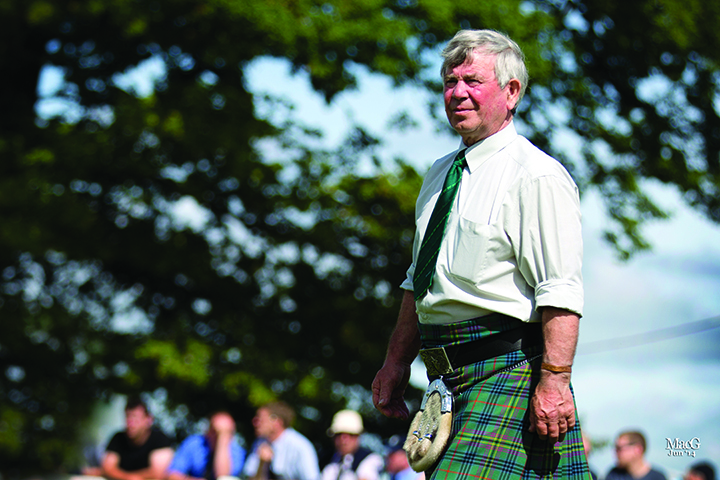 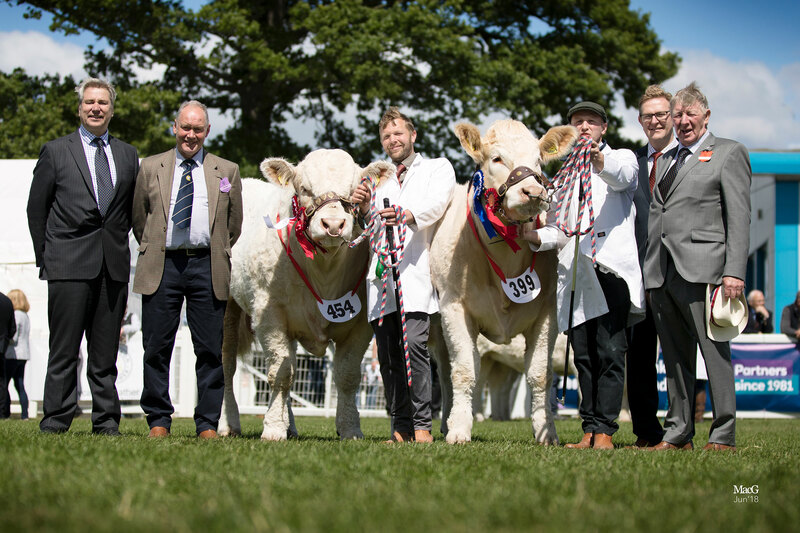 The pair continued their success in the beef interbreed team competition, where they were joined by two year old heifers Glenericht Gem, by Clyth Diplomat from W K and P Drysdale, Blairgowrie, Perthshire, and Inverlochy Gloria from J Irvine and Son, Ballindalloch, Banffshire, a Lochend Apache daughter – to complete a hat-trick of interbreed accolades. 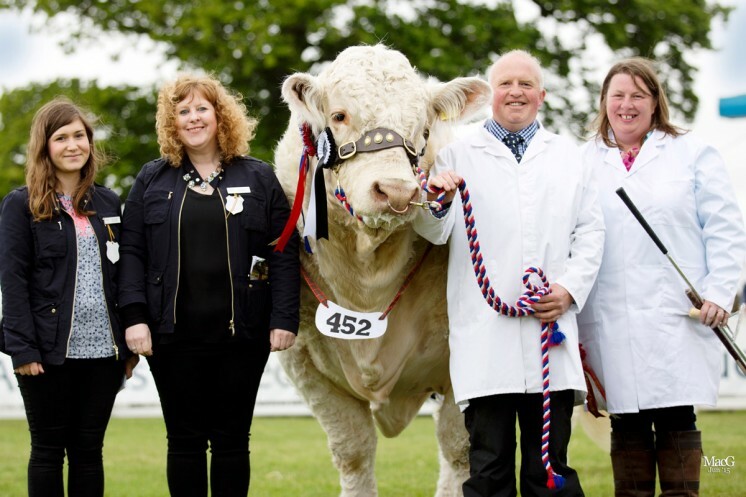 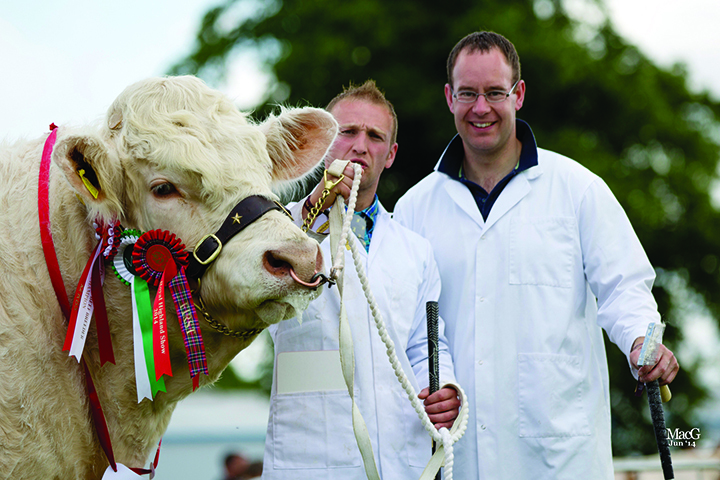 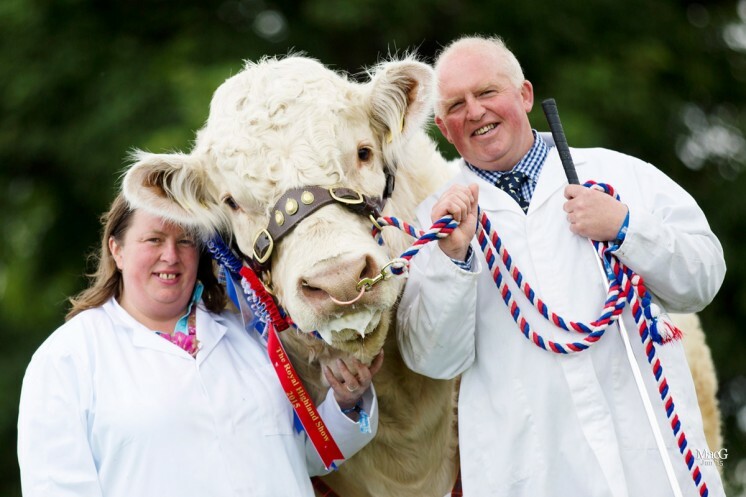 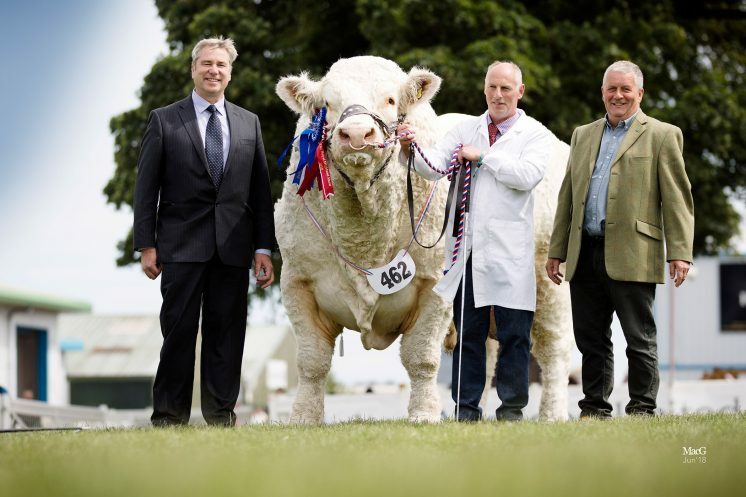 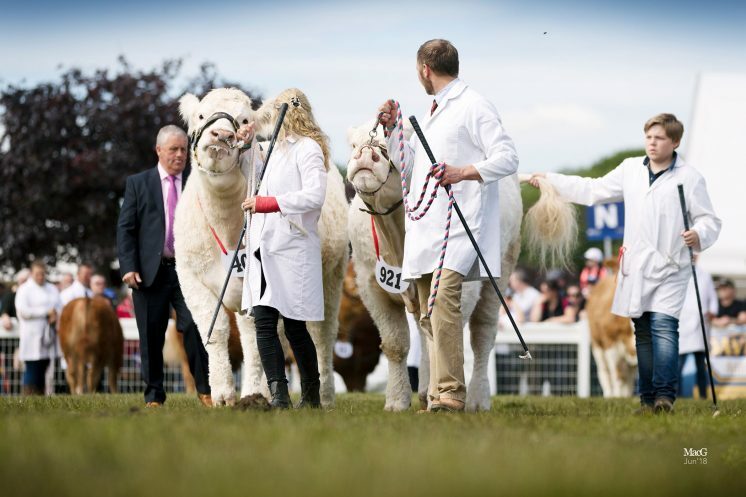 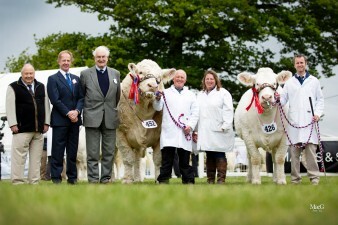 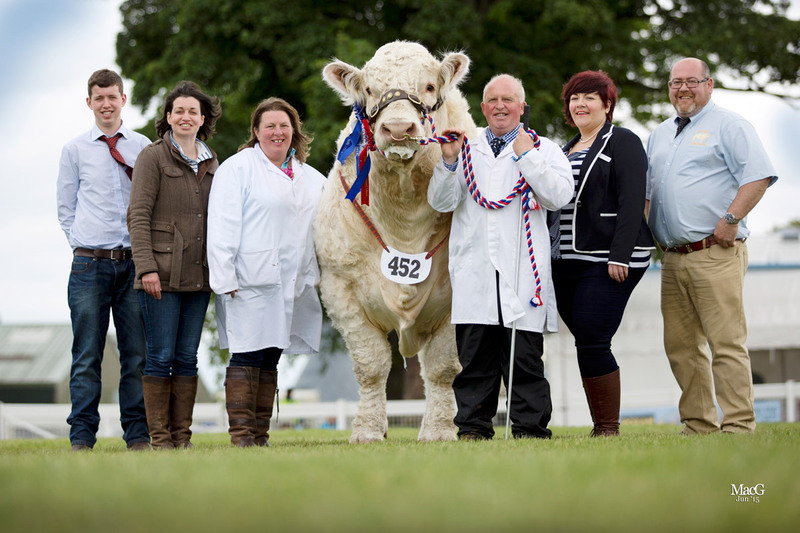 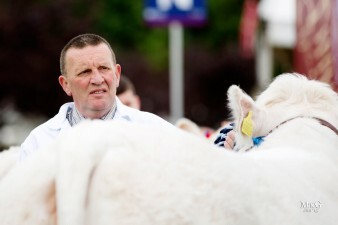 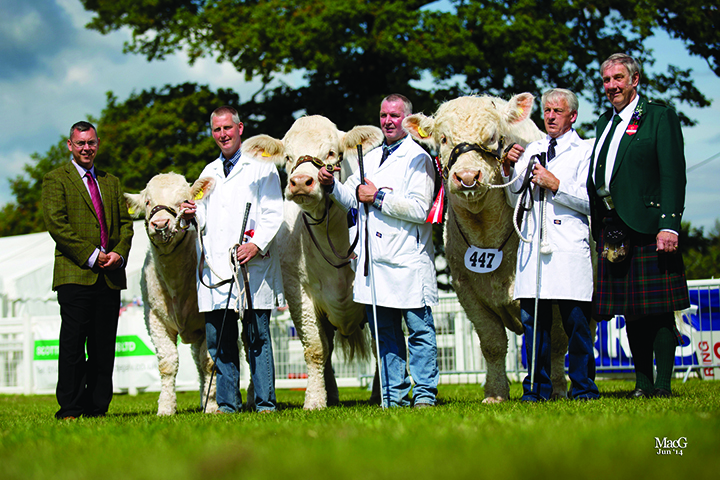 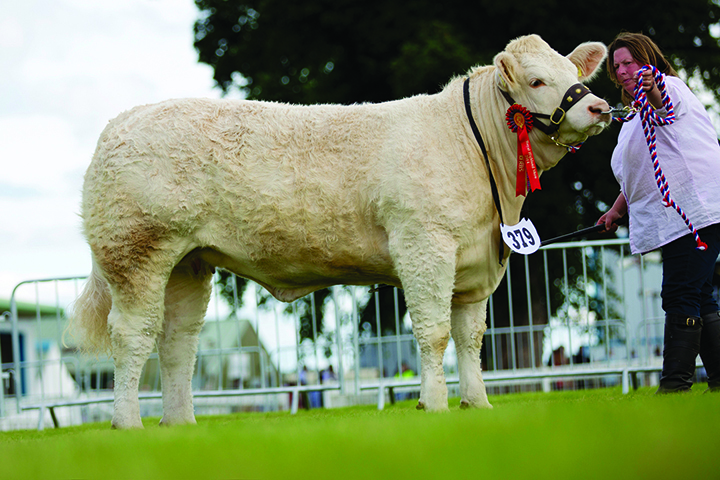 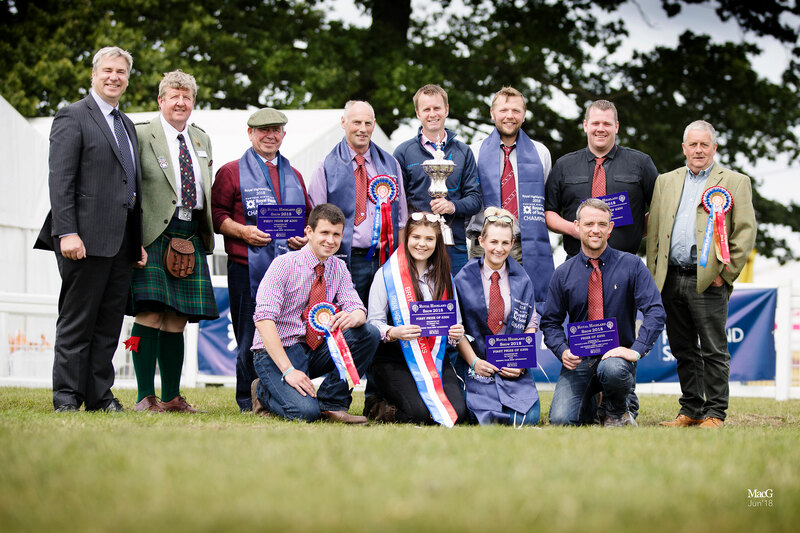 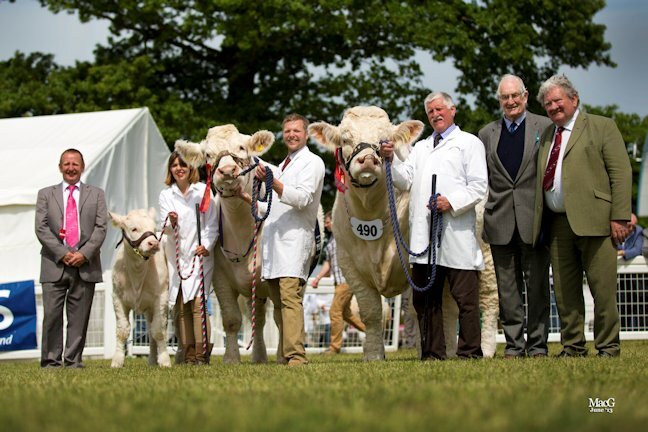 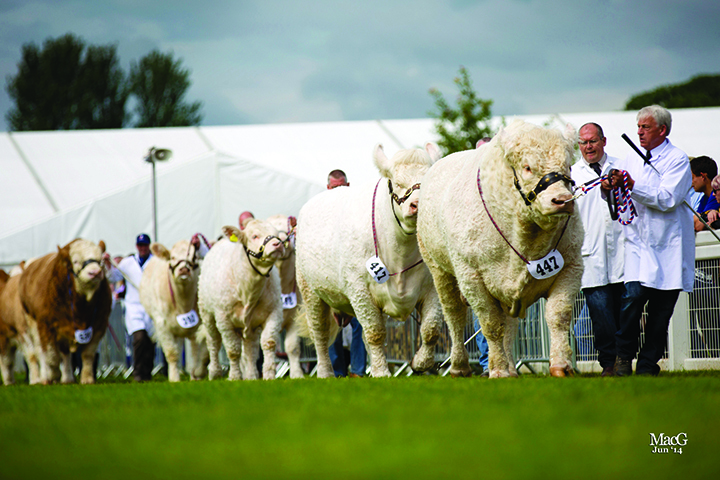 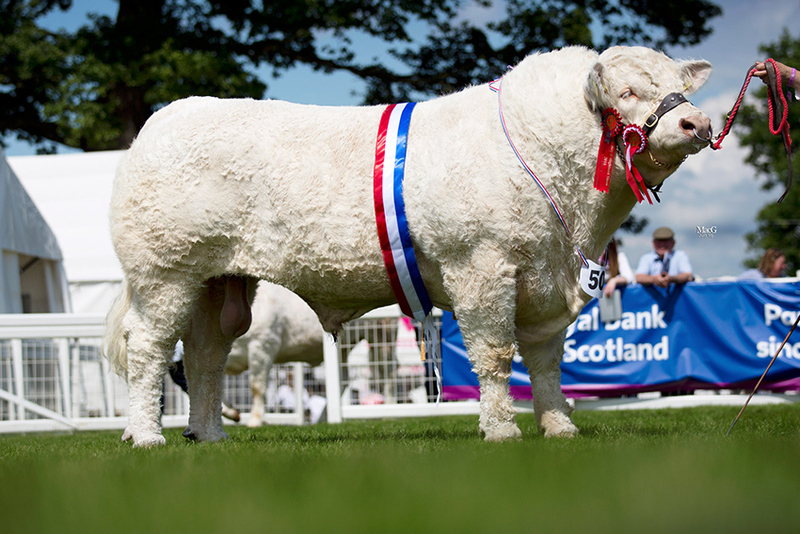 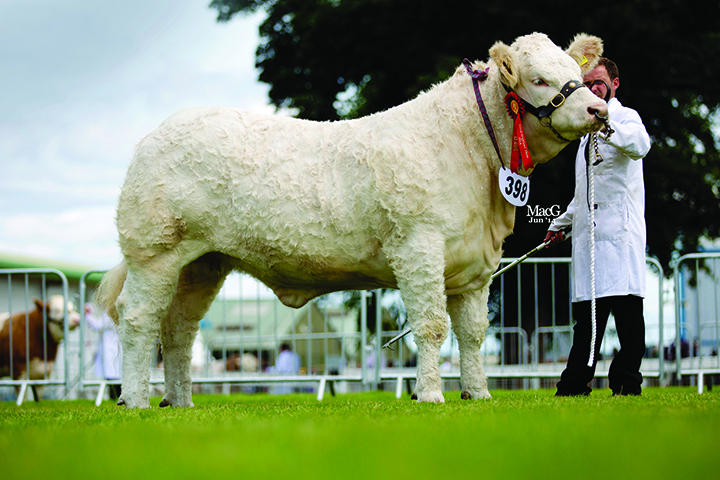 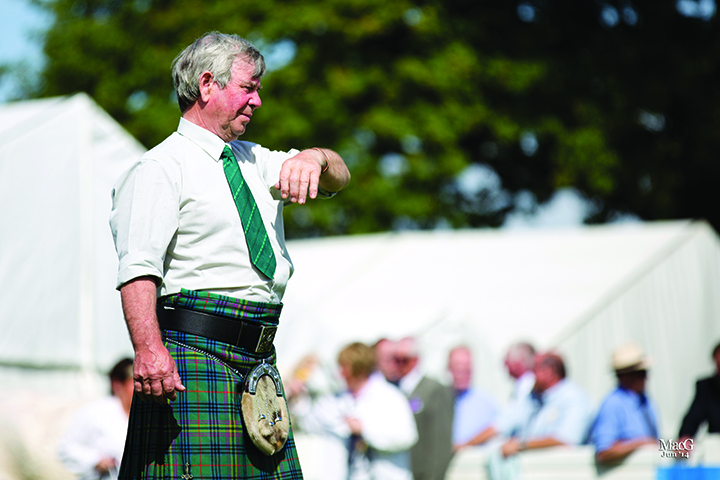 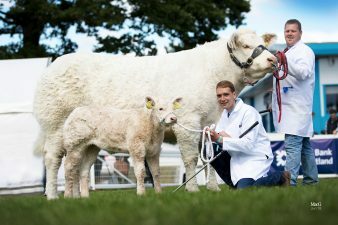 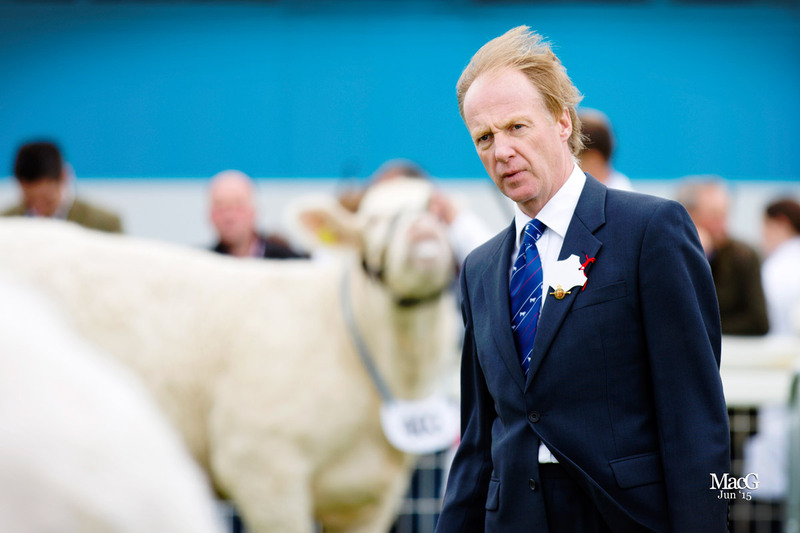 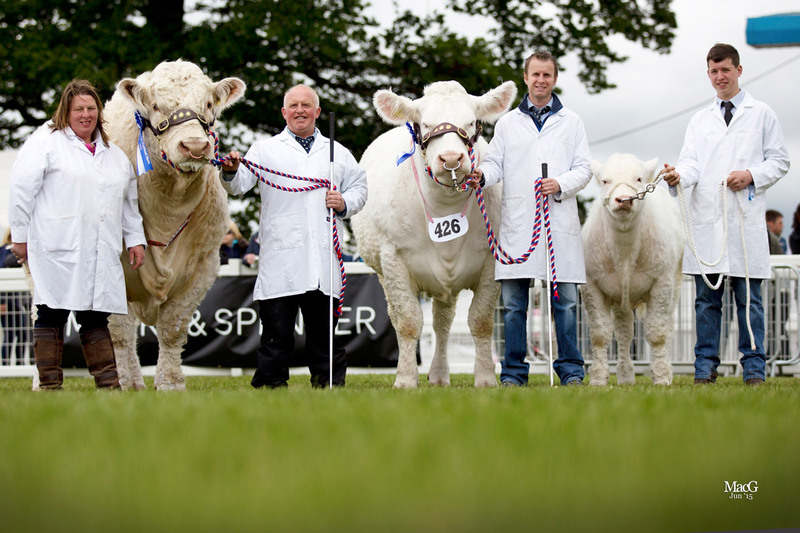 Glenericht Gem had two weeks earlier taken the reserve interbreed honours at Angus Show. 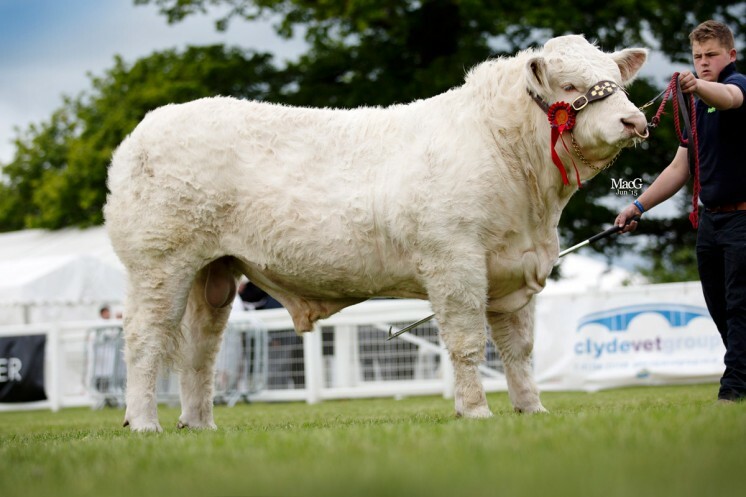 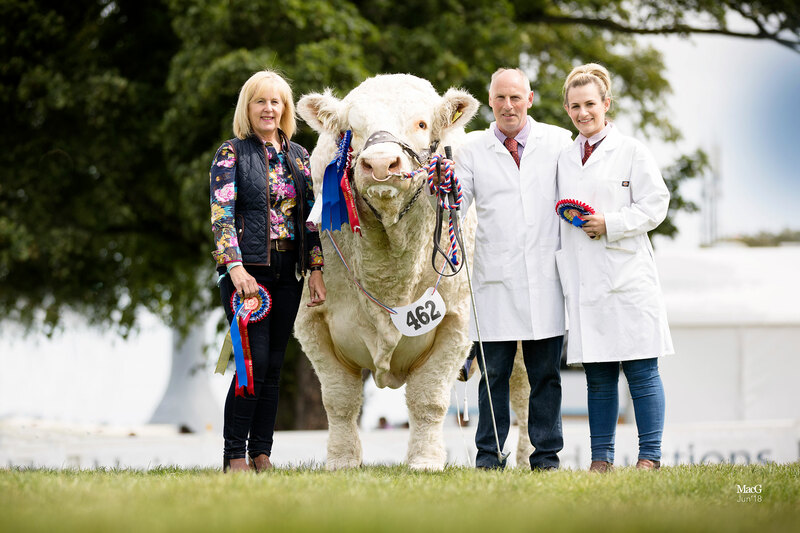 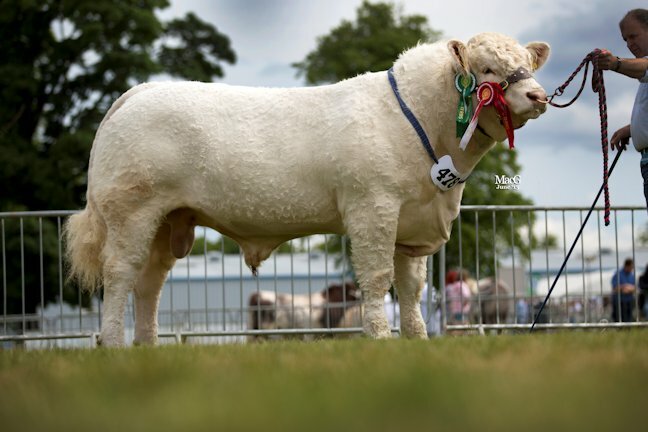 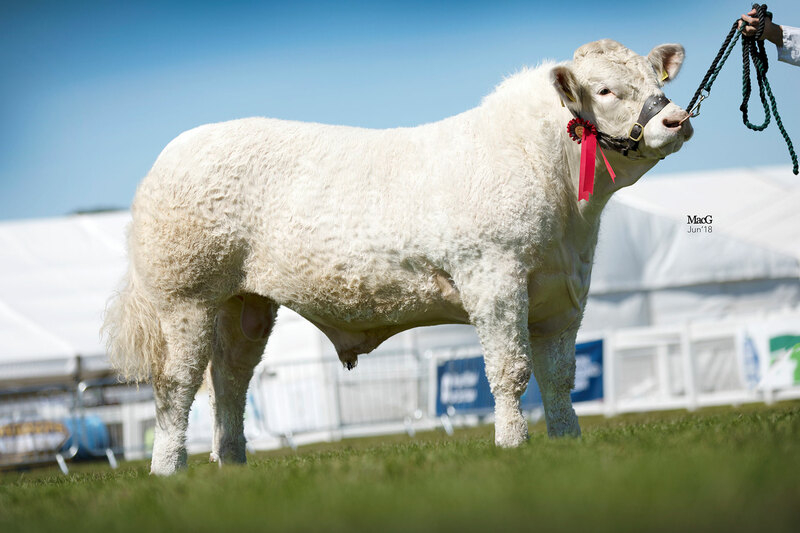 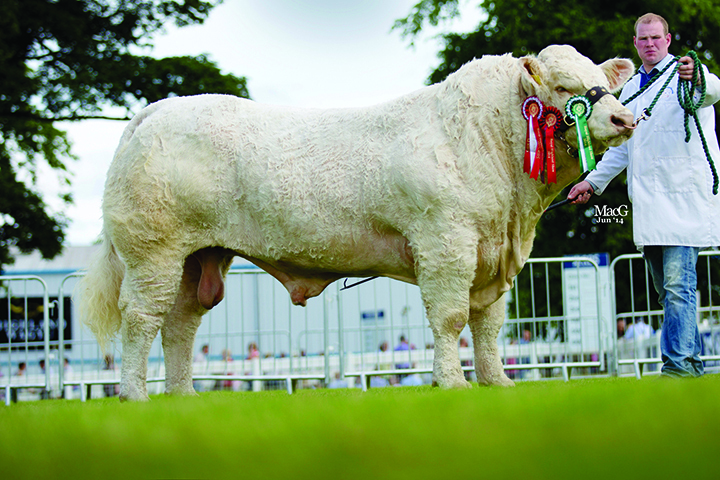 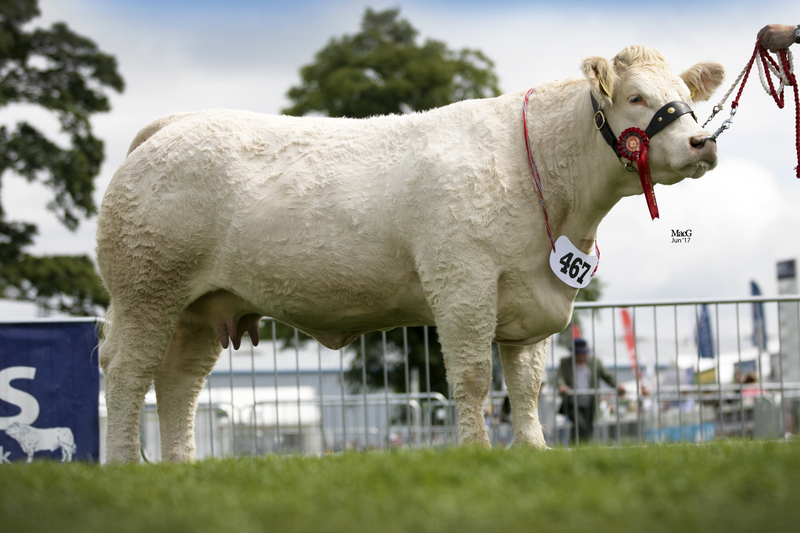 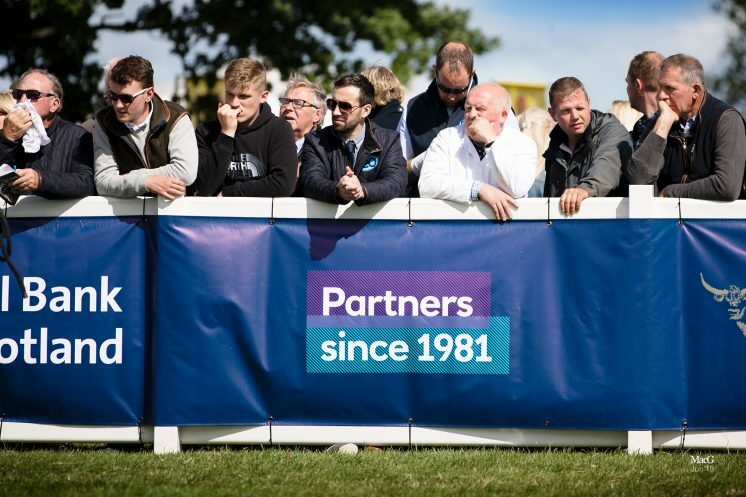 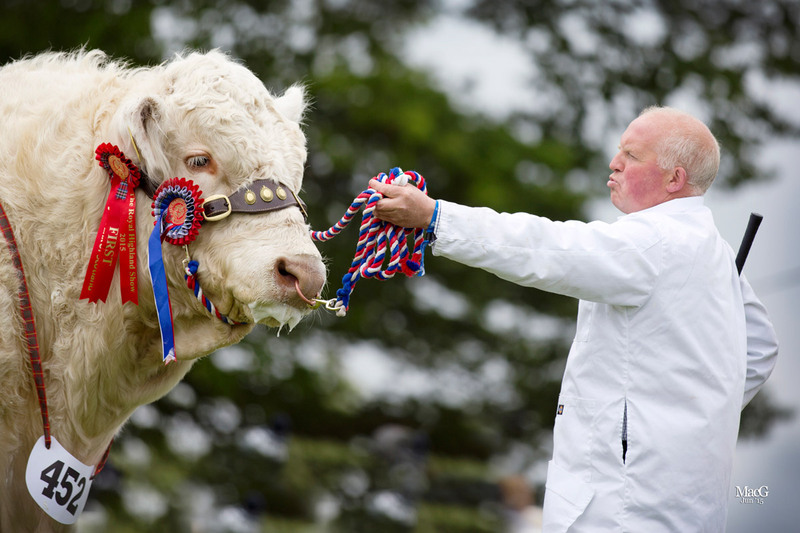 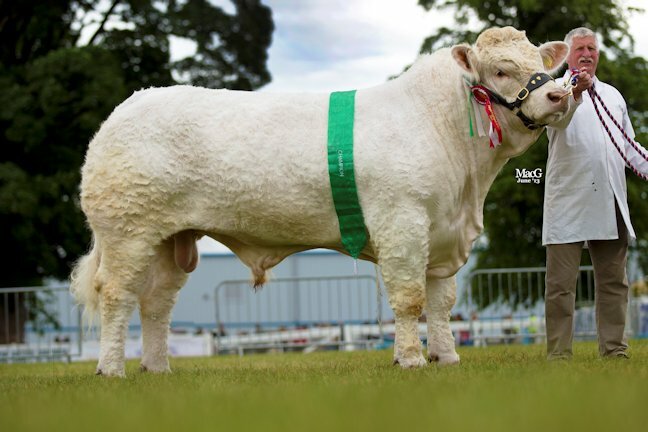 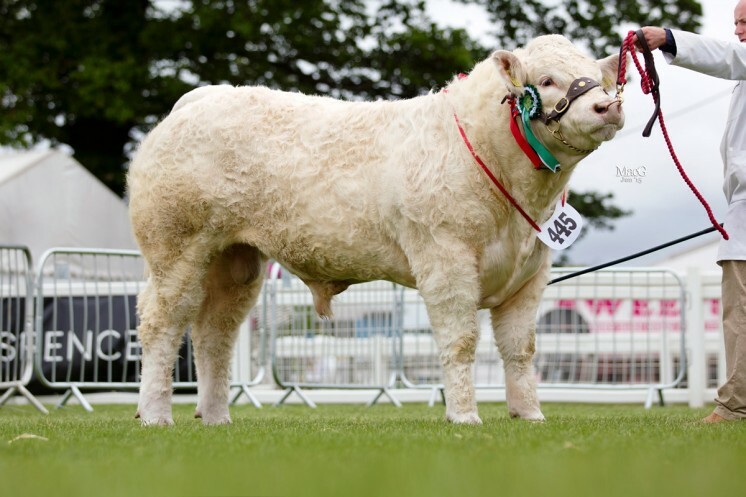 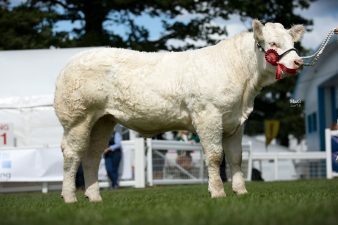 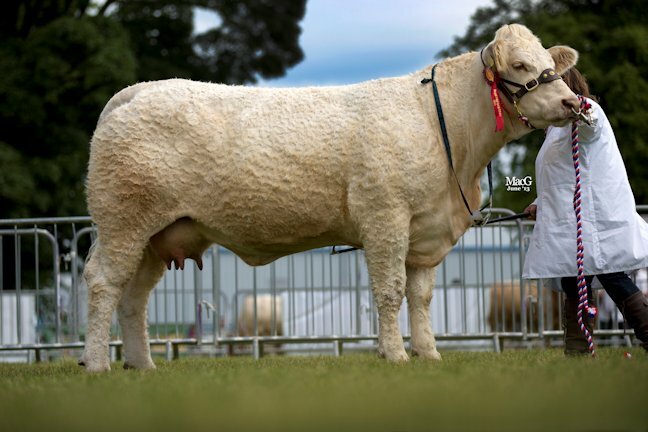 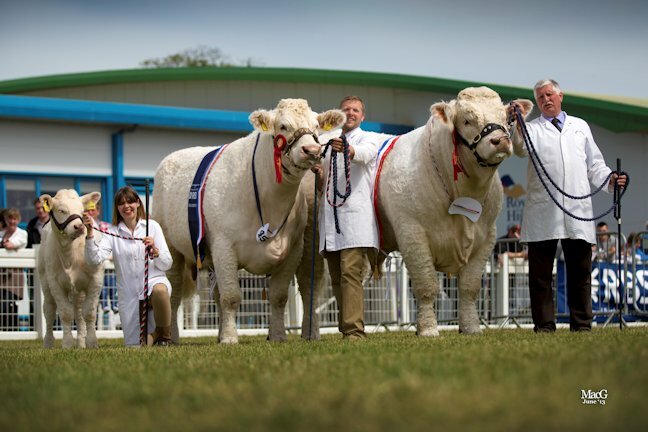 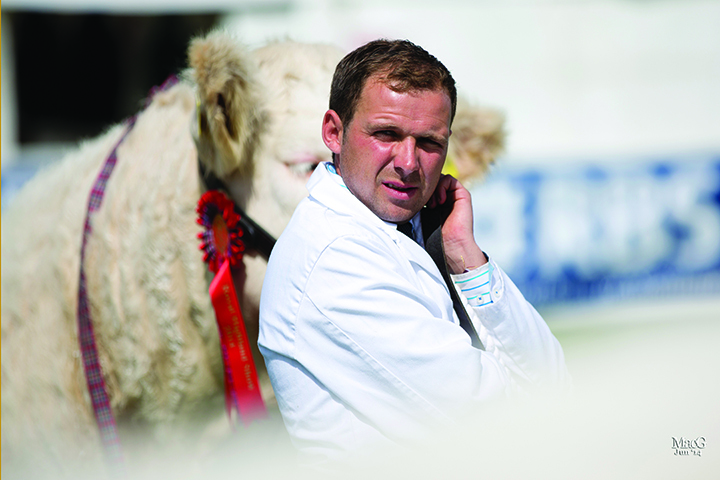 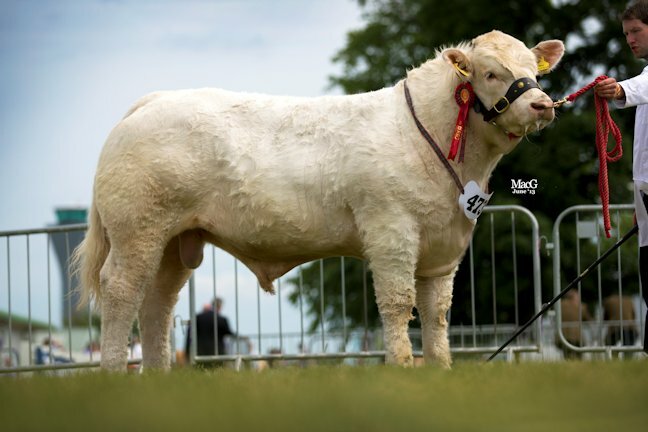 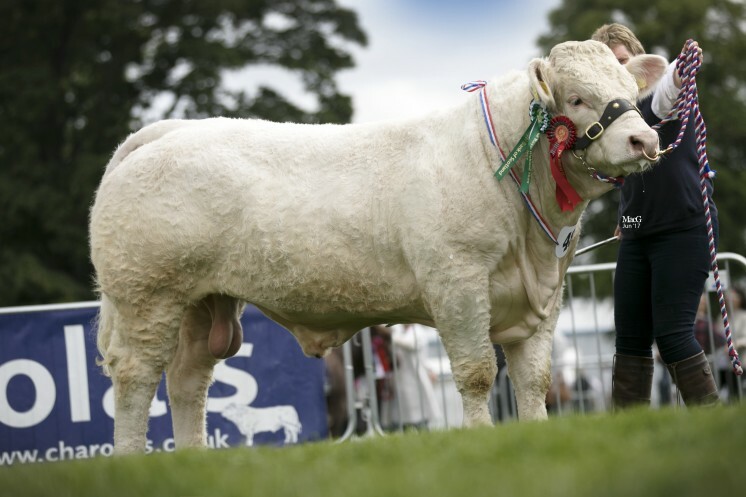 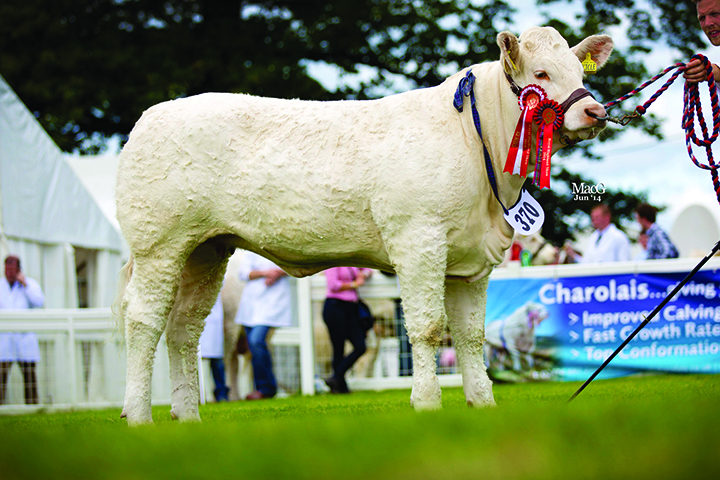 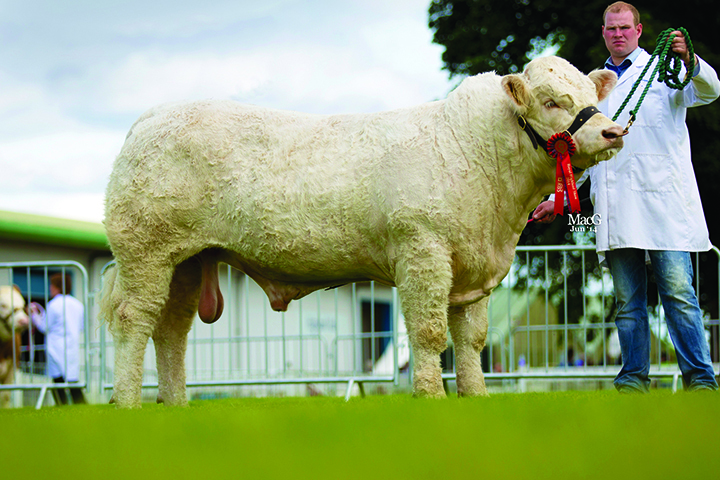 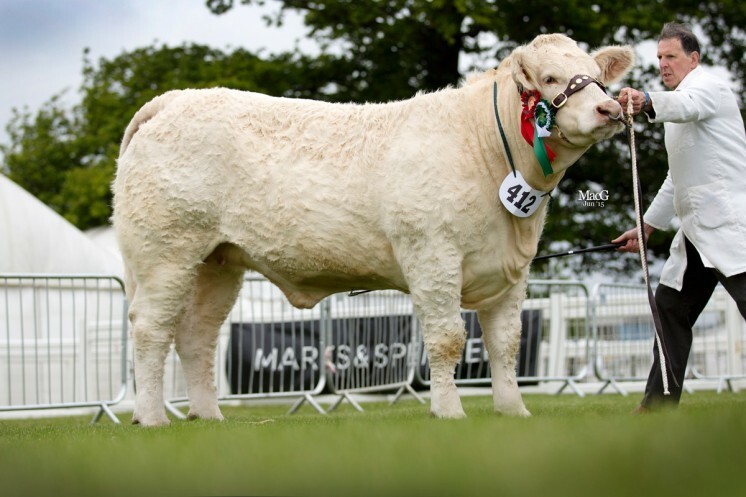 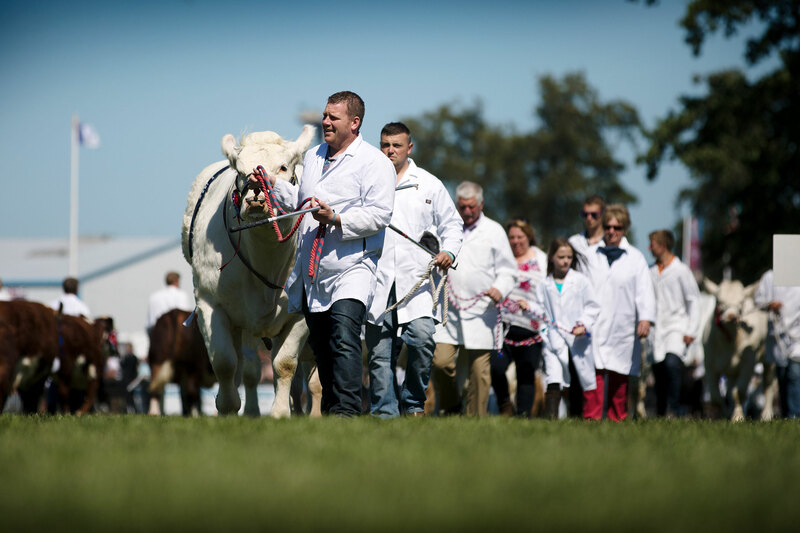 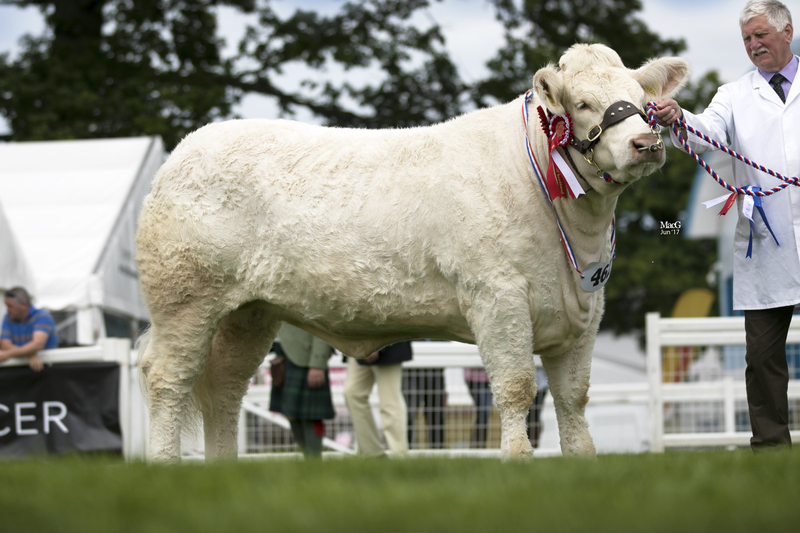 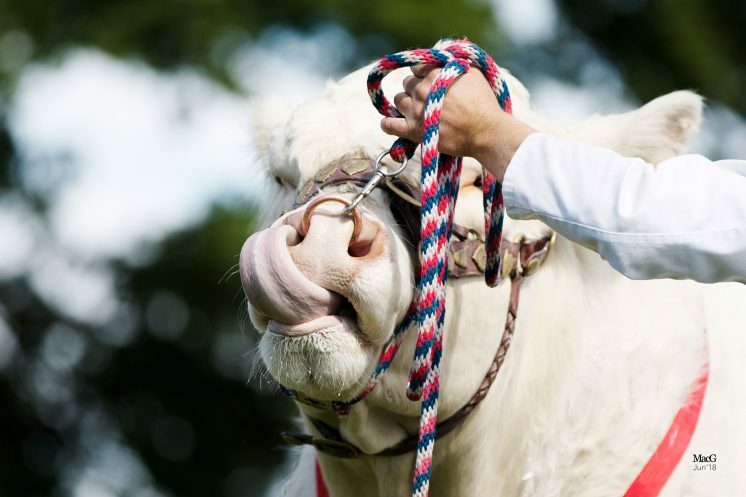 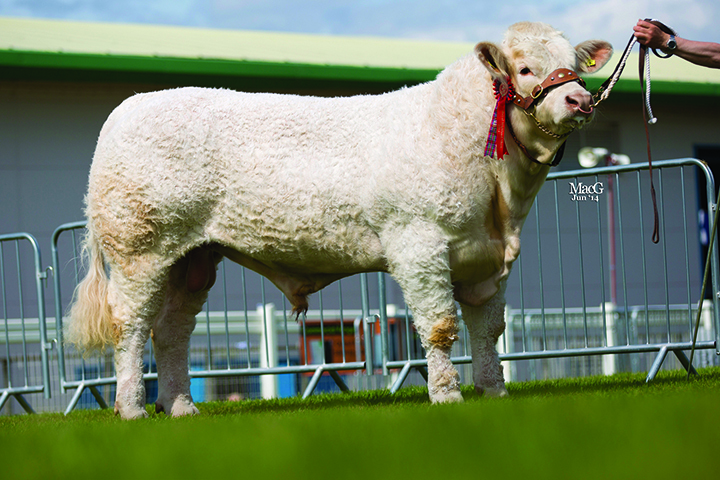 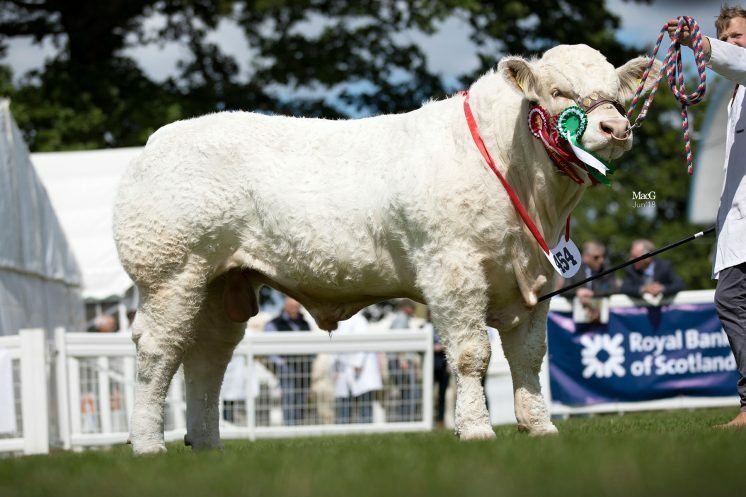 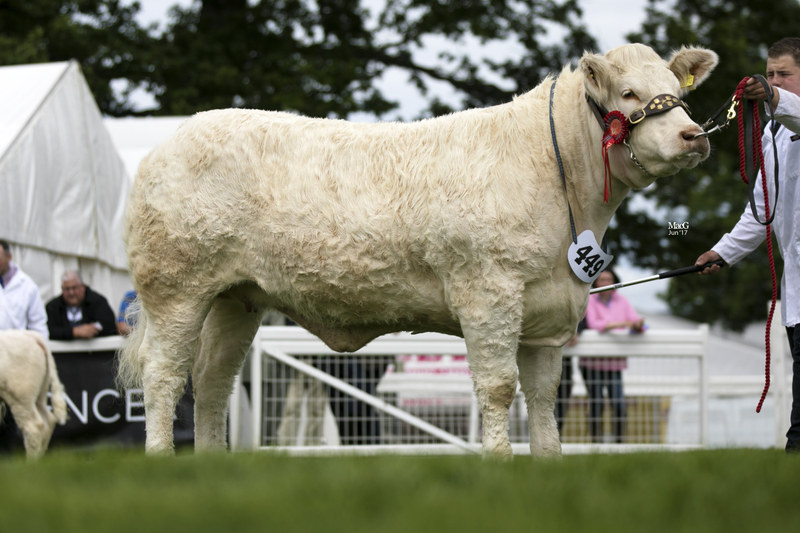 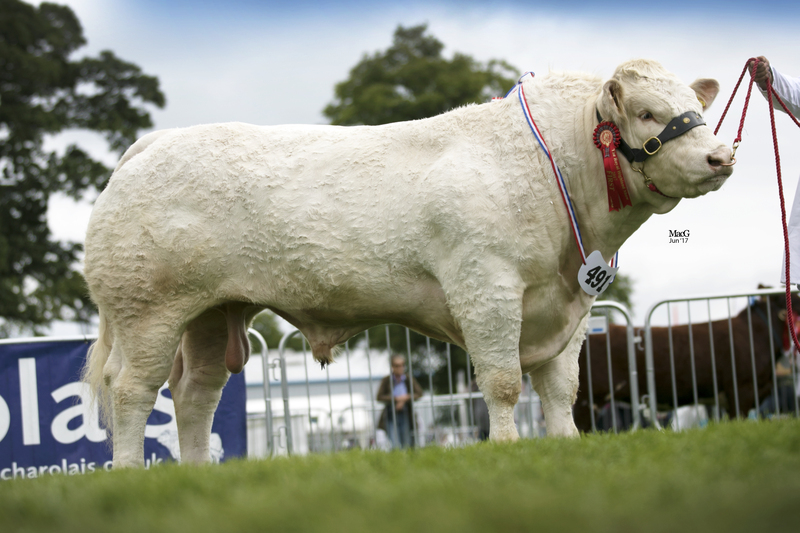 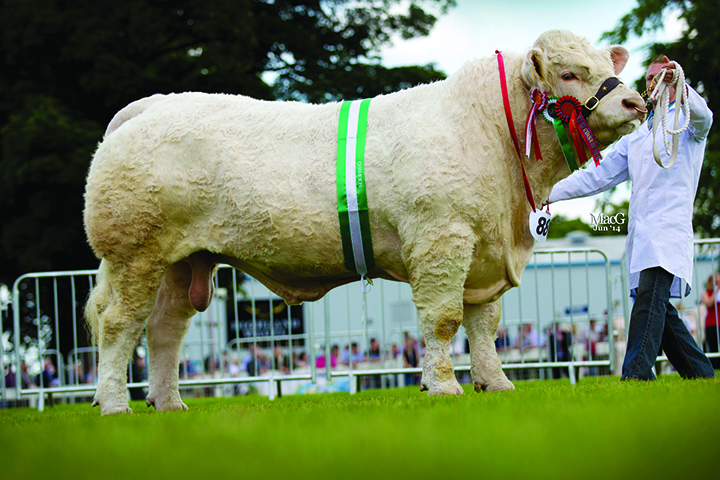 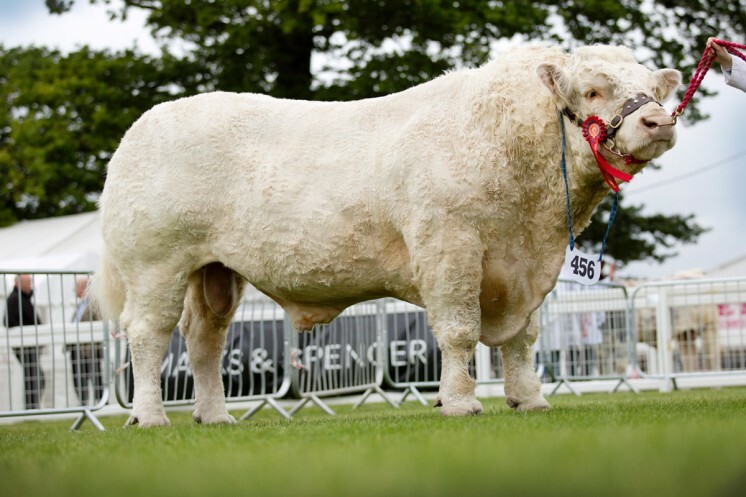 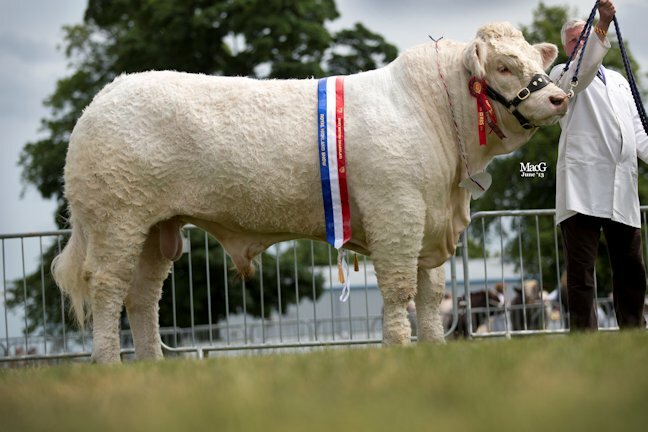 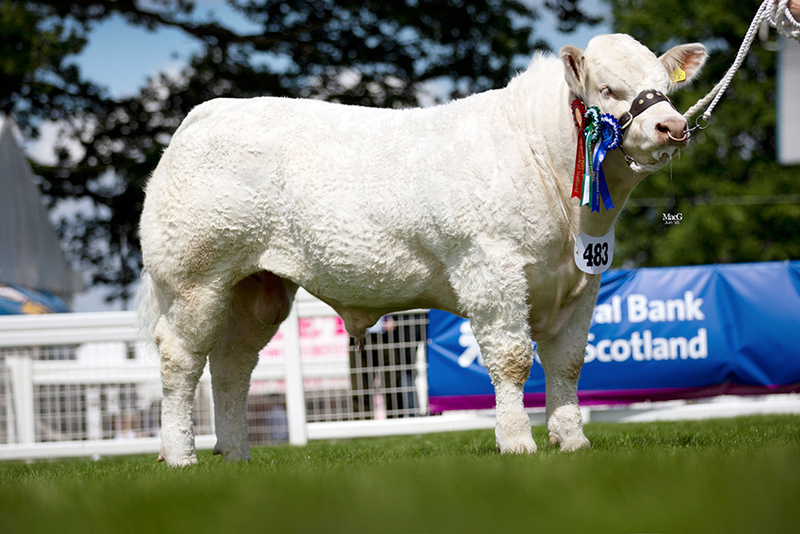 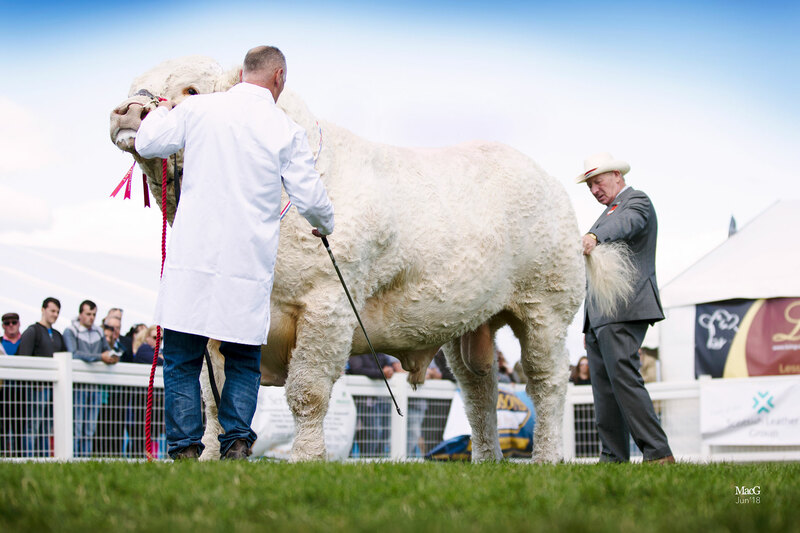 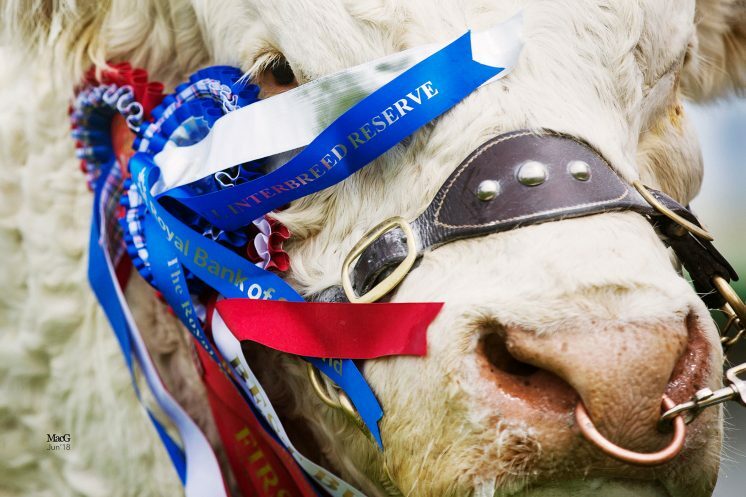 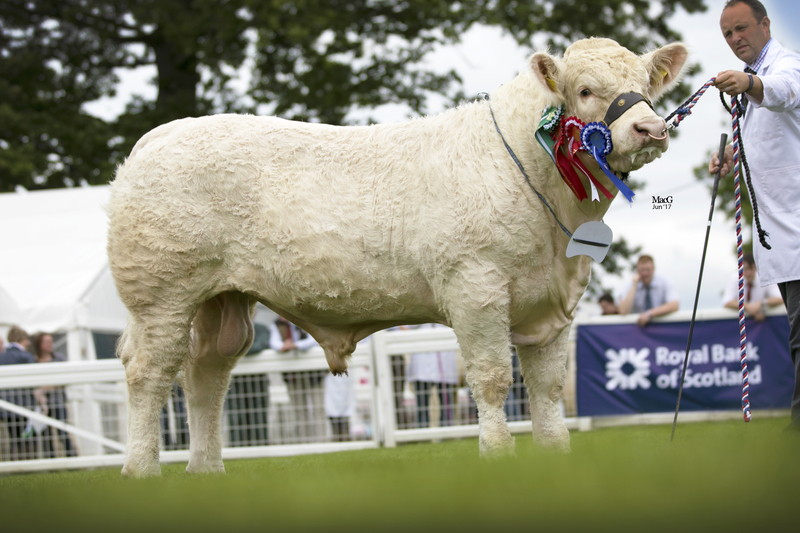 Maerdy Grenadier went on to take the continental title in the Marks and Spencer Beefbreeder and Breedplan championship for performance recorded bulls. 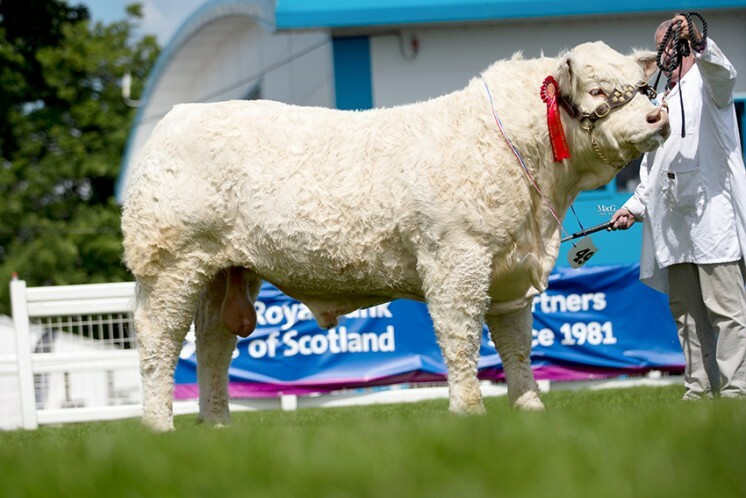 Taking into account visual appearance as well as estimated breeding value (EBV) data, this one was judged by Ewan Brewis, Lempitaw, Kelso, with Elgin Highroller, a 17 month old Elgin Davinci son from the Milnes standing in reserve. 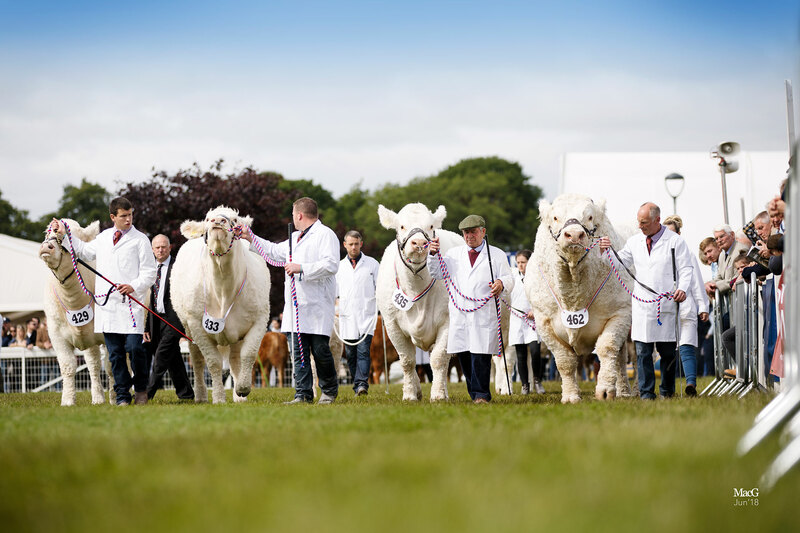 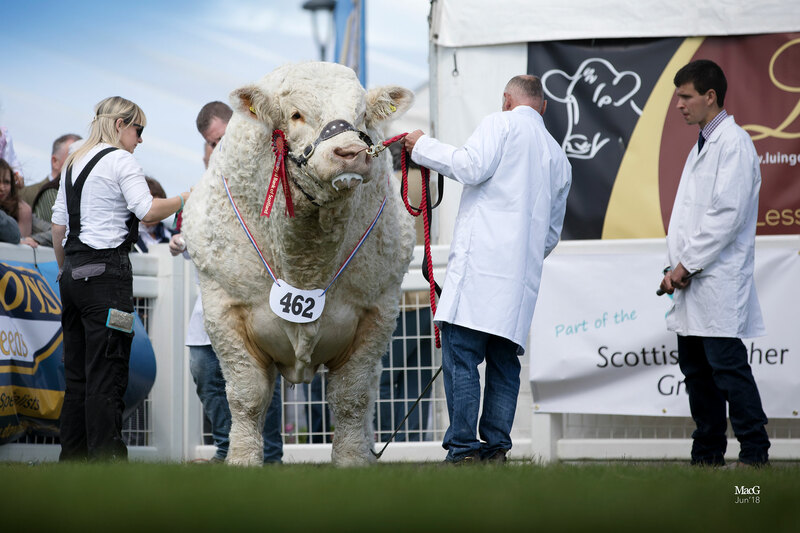 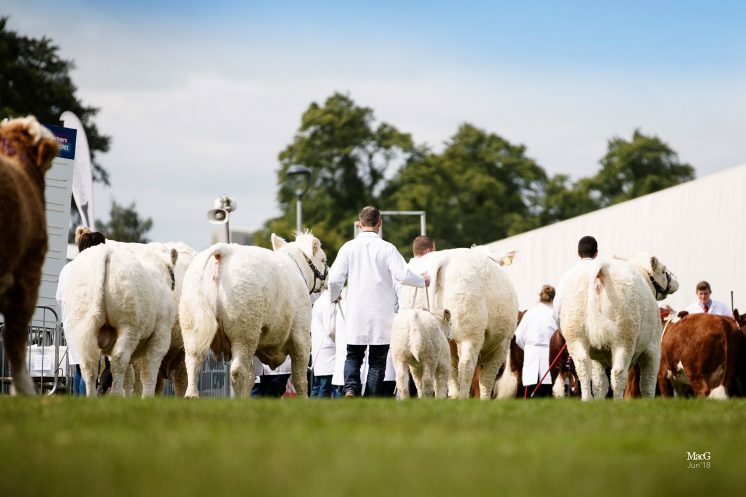 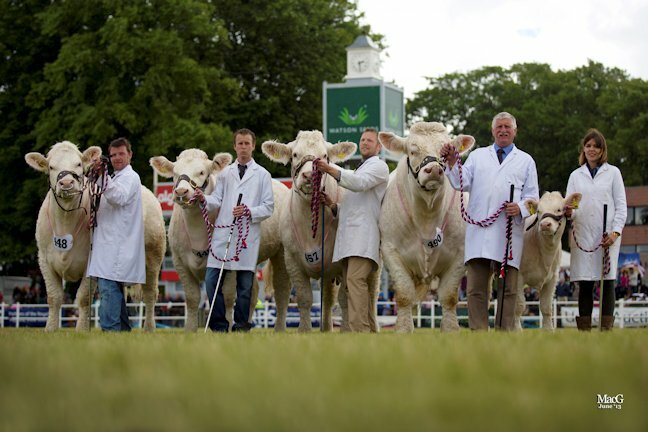 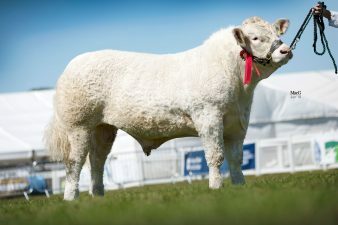 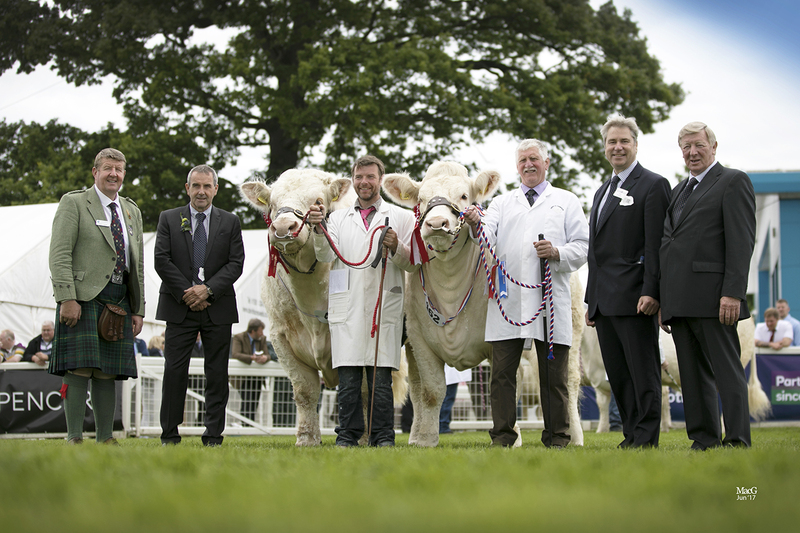 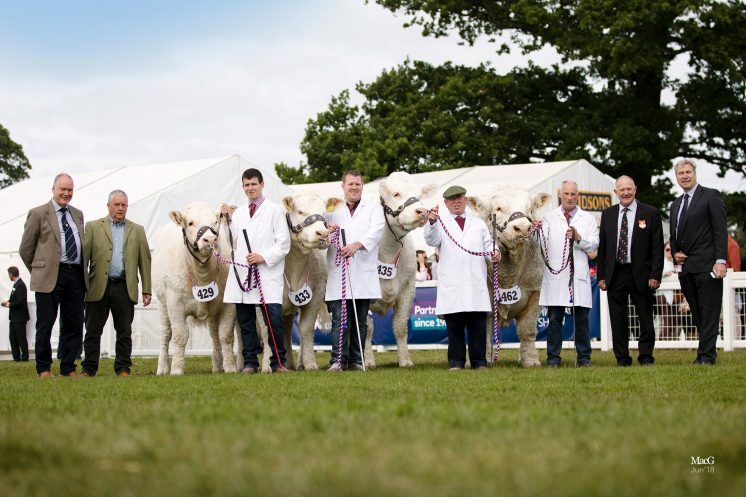 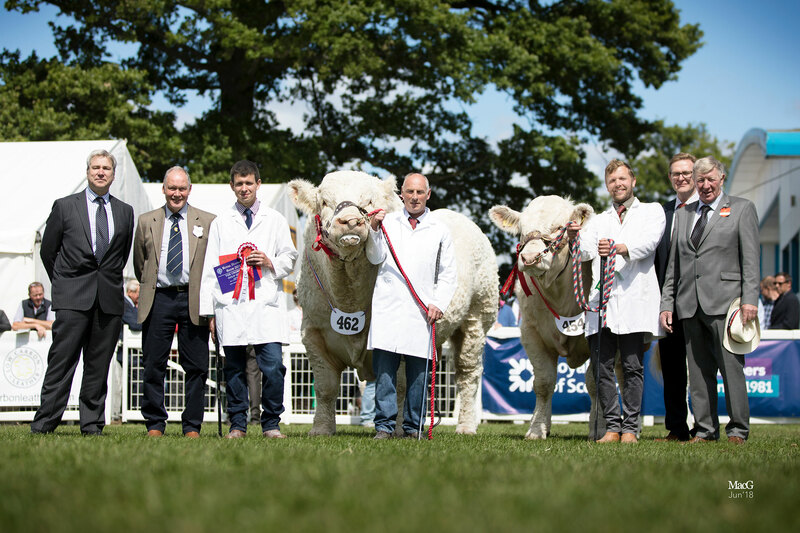 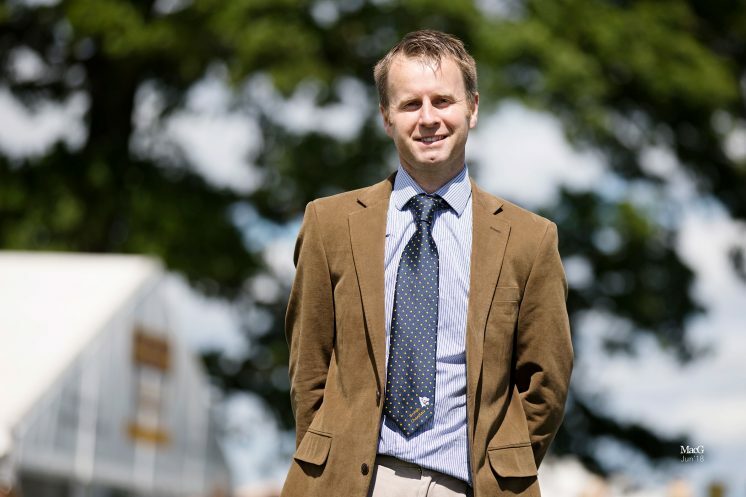 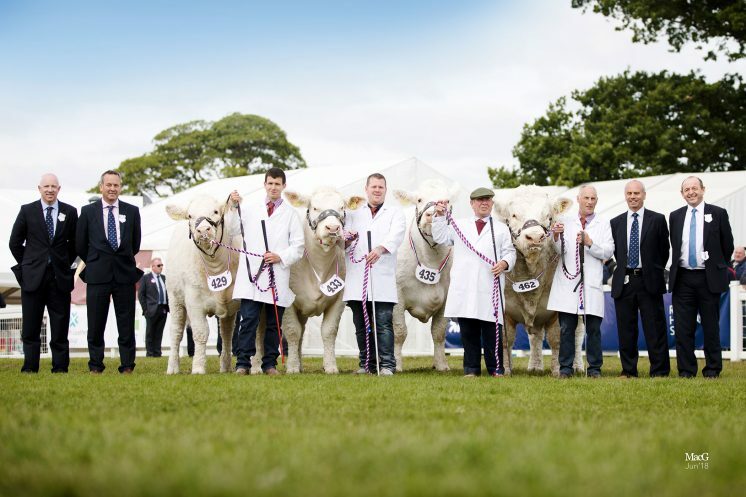 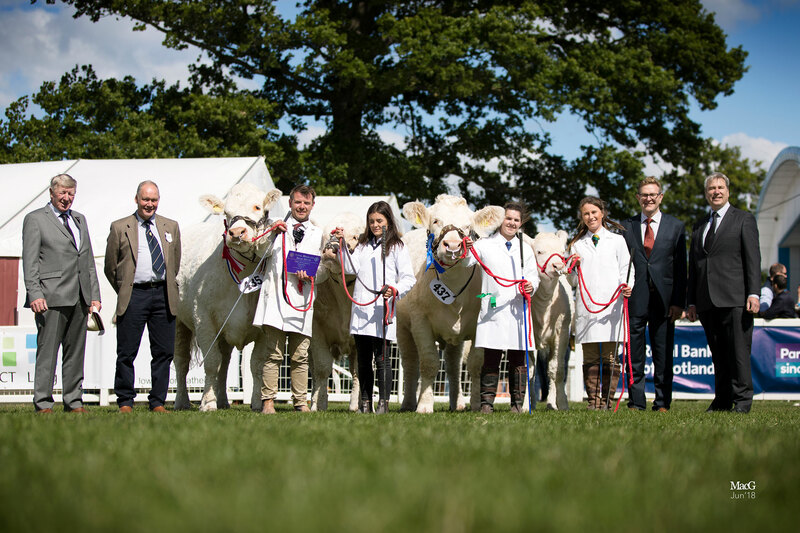 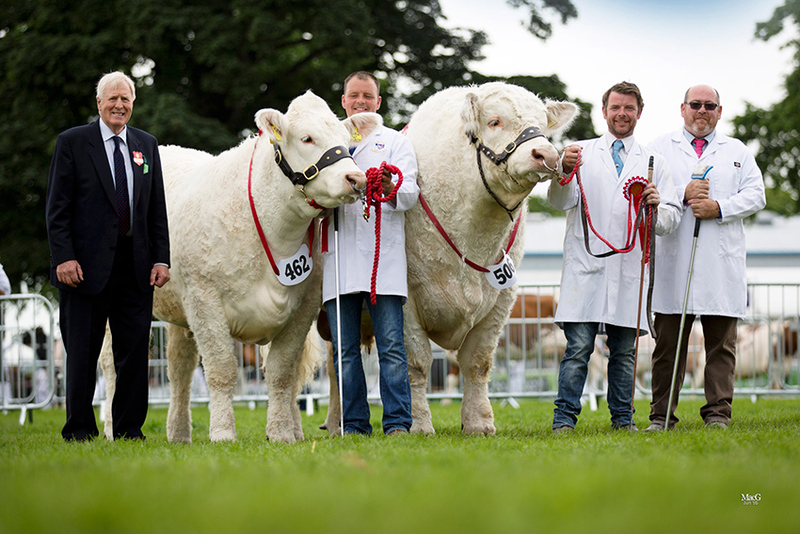 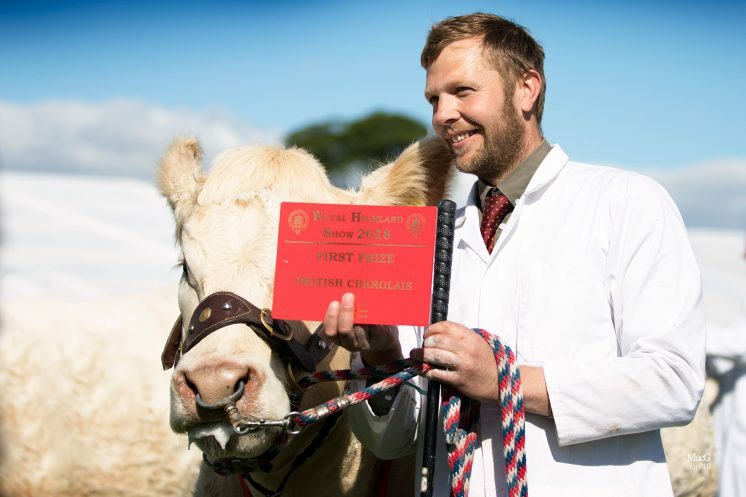 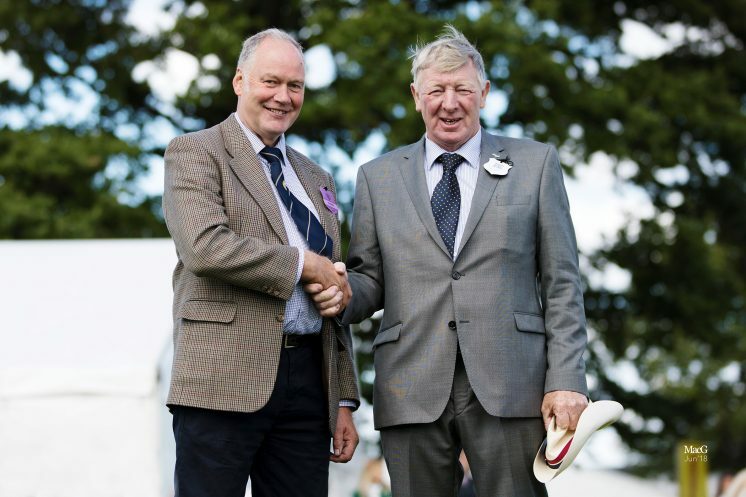 Charolais cross cattle dominated the McIntosh Donald Steak Competition, where a panel awarded the £1,000 prize to a steak from a 341.2kg carcase, graded R4L, from R Green, Oldmeldrum, Aberdeenshire. 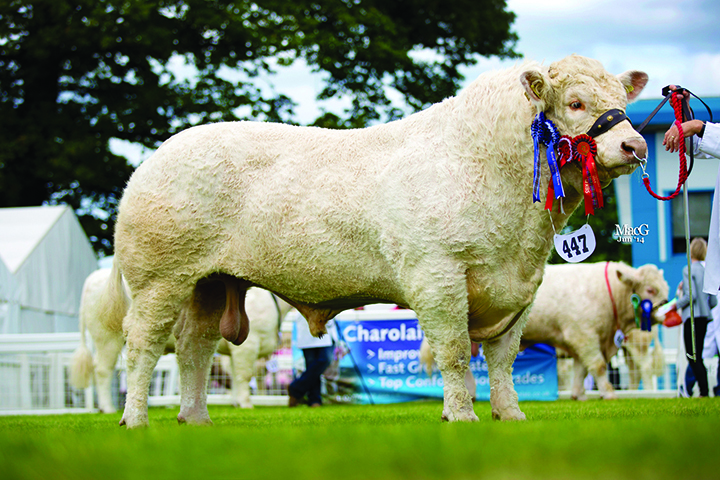 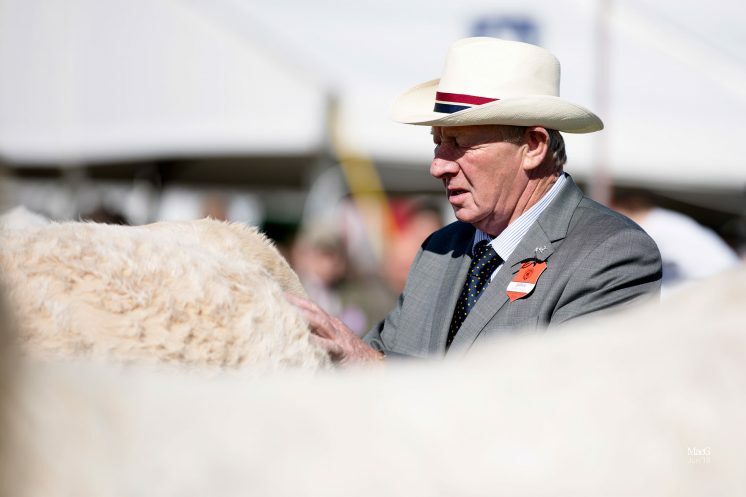 The top four steaks were all Charolais sired and topped an entry of 150 sirloins.